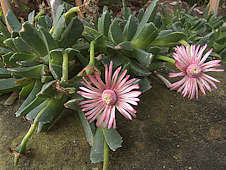 The Aizoaceae is a very large family, largely endemic to Southern Africa, with at least 120 genera including over 1800 species. A few species are found in Australia and the Pacific area. All species are considered succulent but cover a wide range of life styles from pebble-like leaf succulents to small shrubs with fleshy leaves. Distinctive seed capsules are valuable for identifying species. The comon Afrikaans name "vygie" meaning "small fig" refers to the fruiting capsule, which resembles the true fig. The fruits of some species e.g. 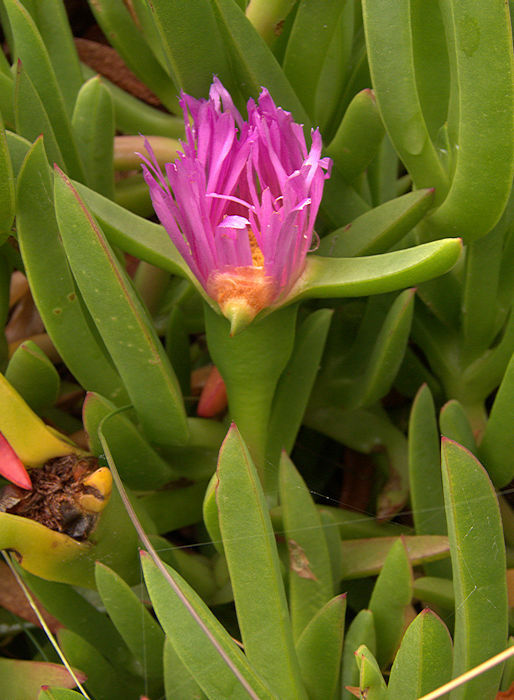 Carpobrotus edulis can be made into a preserve. Some species of Mesembs. have water-storing bladder cells in their epidermis. 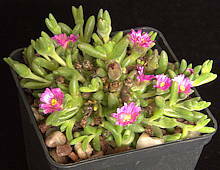 These catch the light so that the succulent foliage sparkles in the sun as if covered in tiny crystals, leading to the common name, "ice plants". 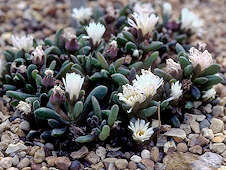 High concentratiuons of the narcotic alkaloid Mesembrine are found at in some Mesembs., notably Sceletium tortuosum (kanna). Cultivation: Watering requirements vary according to a succulent plant's region of origin and hence whether it is a summer or winter grower. Seasons in the Northern hemisphere are reversed compared with those in the Southern hemisphere (South Africa) and most species adjust to this, so when cultivated in the Northern hemisphere grow and need water out of phase with their habitat. 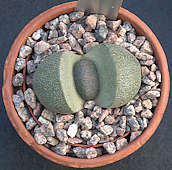 Lithops: are winter growers and should be watered from late summer until November and a little water at the end of the Winter in March. Water should be withdrawn or at least light through the summer. Conophytums: are also late season growers, but watering can be started earlier in July. Click on pictures below for a higher quality image. Name: Greek akros = point + odus = tooth, referring to the toothed leaves. 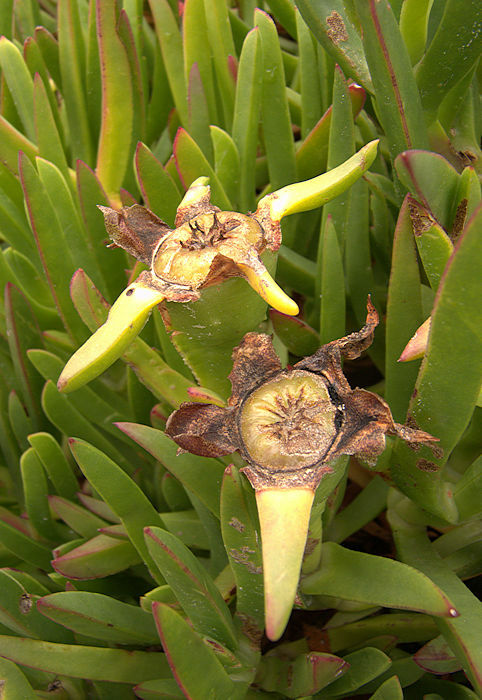 These succulent plants form mats of disorganised rosettes of fleshy dark green leaves with a triangular crossection and rows of small teeth along their edges and keels. The large solitary flowers are on long stalks. Their petals have a darker stripe along their middle. All four species are native to coastal South-Western and South-Eastern Cape provinces of South Africa. They are hardy on well-drained sandy soils. This is the type species for the genus. The large flowers are pale pink with a dark pink stripe along the middle of the petals and a central mass of pink staminodes surrounding the stamens. Native to coastal South Africa where it receives both Summer and Winter rainfall. 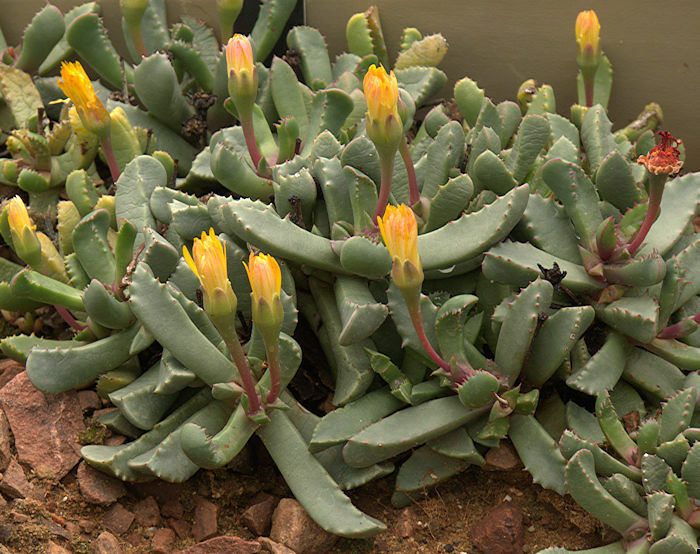 This genus include 16 species of creeping rosulate succulents from Winter rainfall areas of the Eastern, Western and Northern Cape Provinces of South Africa. The roots are thick and in some species (e.g. 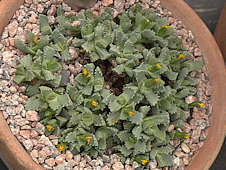 Aloinopsis schooneesii) form a tuber which may be raised for display. 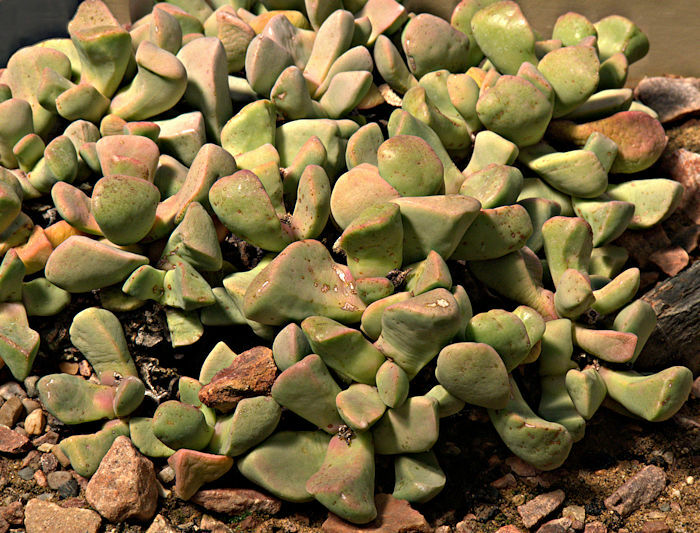 This succulent plant forms a cluster of rosettes formed from fat, triangular leaves with tiny white pustules or teeth on their surfaces. Flowers are bright yellow, around an inch in diameter. 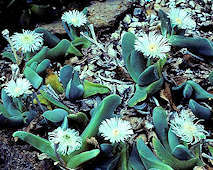 Native to limestone slopes of the central Karoo of South Africa, experiencing small amounts of Winter rainfall. Leaves become bronzed in full sun. In captivity, plants tend to become green and flabby. 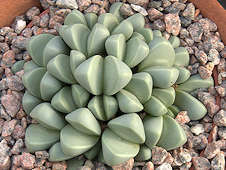 This succulent plant forms a cluster of rosettes formed from fat, triangular, grey to green leaves, the surfaces of which are coverd with tiny dark dots. The tuberous root can be raised for display. Flowers are bright yellow, opening in late afternoon. Native to the North-Eastern Cape of South Africa, typically growing at 4000 - 5000 ft above sea level. Sometimes placed in the monotypic genus: Prepodesma. N.E. Brown 1930. Name: Greek antimimos = imitating, as the first species described resembled Argyroderma. 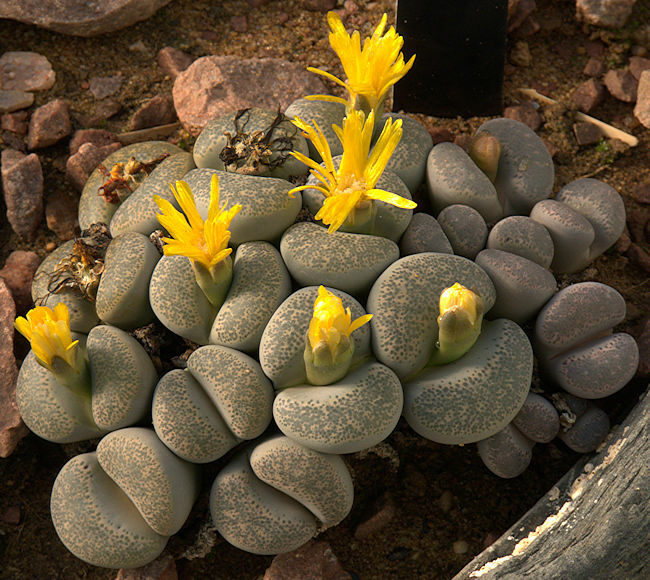 A large genus with 99 species of compact mat and cushion-forming Mesembs from Namibia and South Africa. Most species were moved into this genus from Ruschia which they closely resemble and the genus is now somewhat heterogeneous in form. 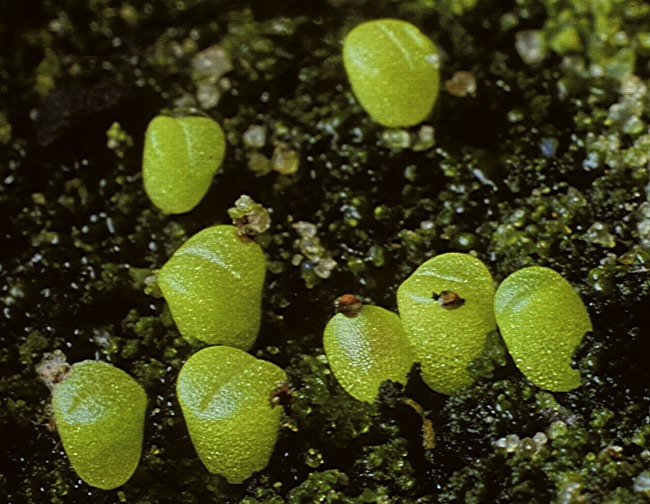 Antimima are mainly differentiated from Ruschia by the structure of their bowl-shaped fruits which have 5 locules and large closing bodies. The valves expand with the help of broad, irregularly-lobed expanding keels. 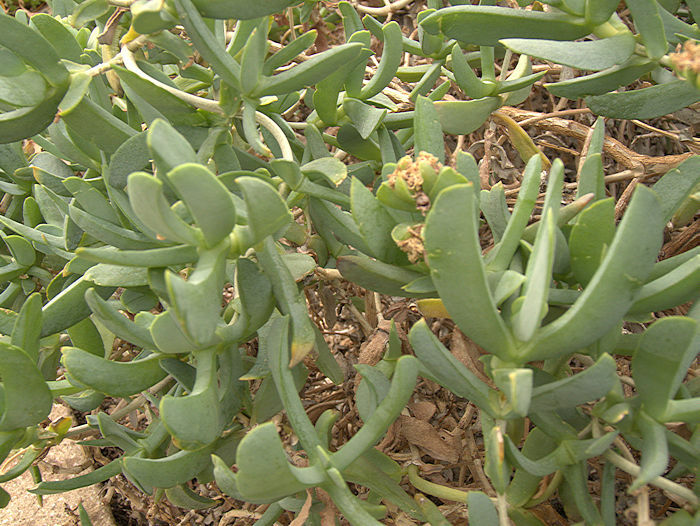 The small succulent leaves have a triangular cross section, typically with roughened surfaces covered in wax. However, some species exhibit differentiation in leaf form with lower leaves forming a sheaf around the base of the later pair. The pink or purple or occasionally white flowers have a central cone of filamentous staminodes surrounding the yellow stamens. A dwarf shrubby succulent plant with small purple flowers. Name: Greek a- without + pteron = wings, referring to wingless fruits. 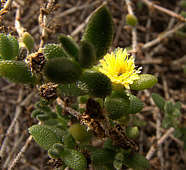 This genus include 4 species of creeping to erect succulent sub-shrubs from the Summer rainfall areas of South Africa. A prostrate creeping plant with fibrous roots and 4-angled stems bearing small, waxy, heart-shaped, succulent leaves with bladder cells which catch the sun. The small flowers are pink. Many cultivated plants are hybrids (A. cordifolia x A. hackeliana) with narrower leaves than Aptenia cordifolia and red flowers like those of the variegated cultivar illustrated. 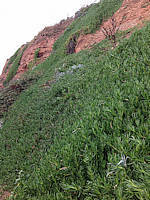 Aptenia cordifolia is native to coastal plains of the Eastern Cape of South Africa, where it tolerates sea spray, and KwaZulu-Natal. 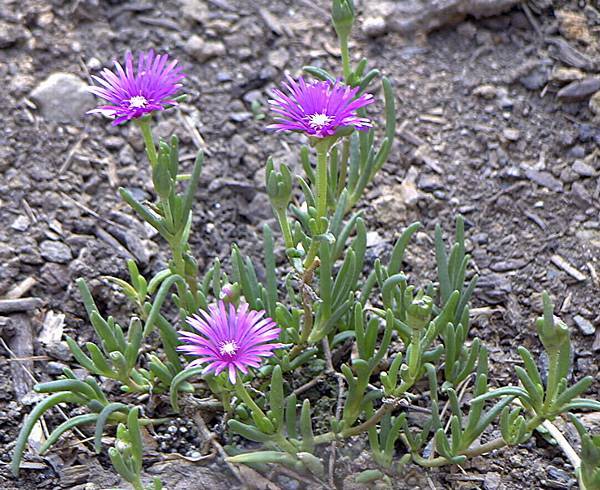 Aptenia cordifolia is a traditional medicinal plant said to have anti-inflammatory properites and used to dress wounds. This prostrate creeper spreads as ground cover, often in light shade. In a sunny, well-drained position it may even survive the British Winter. Aptenia cordifolia has become naturalised in many temperate countries and in some is regarded as an invasive weed. 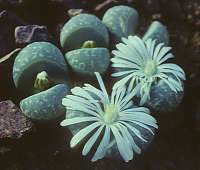 This genus includes around 10 - 12 species, with many sub-species and synonyms, of short-stemmed clumping plants with pairs of highly succulent blue-green ovate to cylindrical leaves cleft in the middle. The daisy-like flowers produced from the cleft between the leaves may be white, yellow, or purple and colour variation is seen even within single populations. 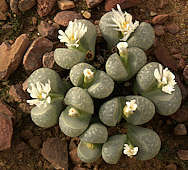 The genus is restricted to the Knersvlatke area in southern Namaqualand in the Western Cape Province, South Africa. Plants mostly grow in quartzite patches. They should be watered during the late Summer. 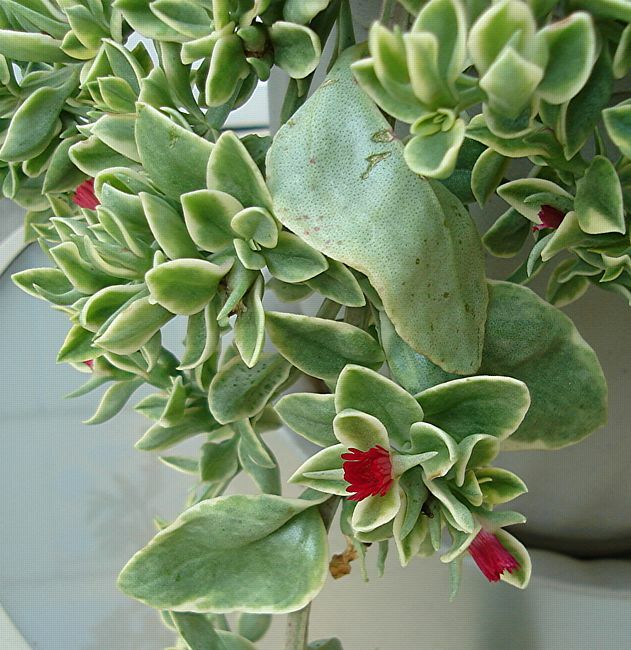 This plant forms a compact cluster of keeled, ovate, succulent leaves supported on branching stems. Flowers may be white, yellow, pink to purple. 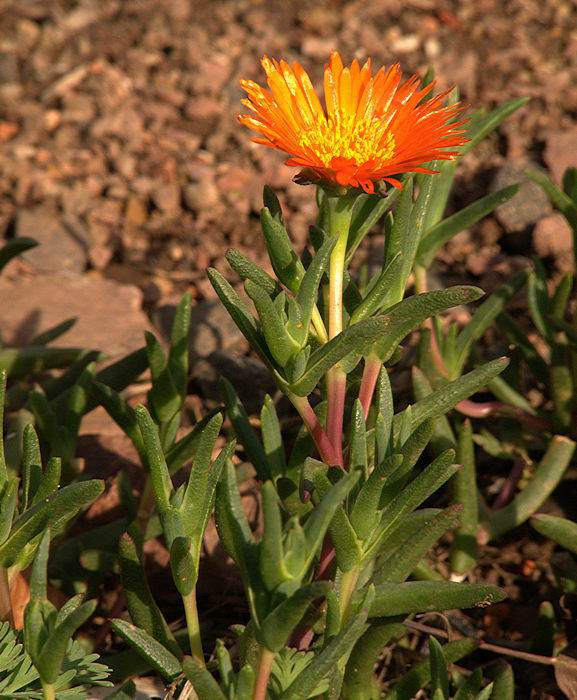 Native to the West coast of South Africa around Vanrhynsdorp and Vredendal, typically growing in quartzite patches. The genus is either monotypic for Bijlia tugwelliae or includes two rather similar species with a similar distribution. 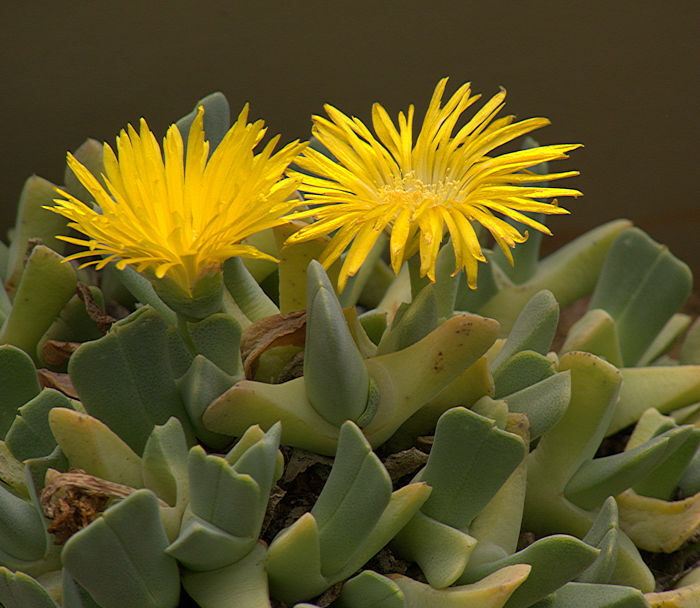 The compact plants have three to five branches bearing rosettes formed from pairs of thickened keeled blue-green, succulent leaves and bright yellow flowers with a central tuft of yelow stamens. The outer epidermis contains a thick layer of crystals of oxalate giving a whiteish appearance. In some taxonomic treatments (e.g. L. Bolus 1930), Hereroa is merged with Bijlia. Native to the Great Karoo of South Africa. This is the type species for the genus. B. dilatata has thicker leaves. However, within a single clump of Bijlia a range of leaf thicknesses can be observed. 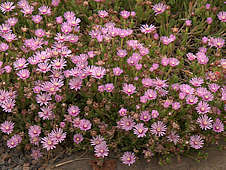 A genus with at least 5 species of shrubby or mat-forming Mesembs, native to the Western Cape Province of South Africa. 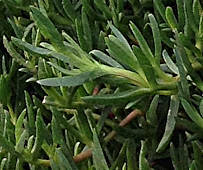 Pairs of highly succulent leaves with translucent margins are characteristically fused in their lower portions and stacked at right-angles to the previous pair. Flowers range from bright pink to white. Name: Latin apiculata = ending in a short sharp point, referring to the leaves. 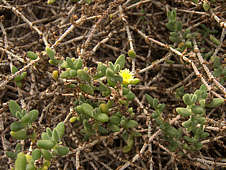 A sub-shrub with woody erect brown stems bearing grey-green keel-shaped opposite pairs of leaves with translucent margins and a sharply-pointed end. The lower half of each pair of leaves is fused and leaf pairs are stacked up with the next pair at right-angles to the lower one. 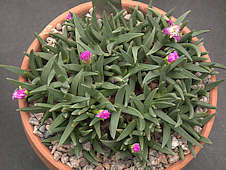 Bright pink flowers are produced in early Spring. 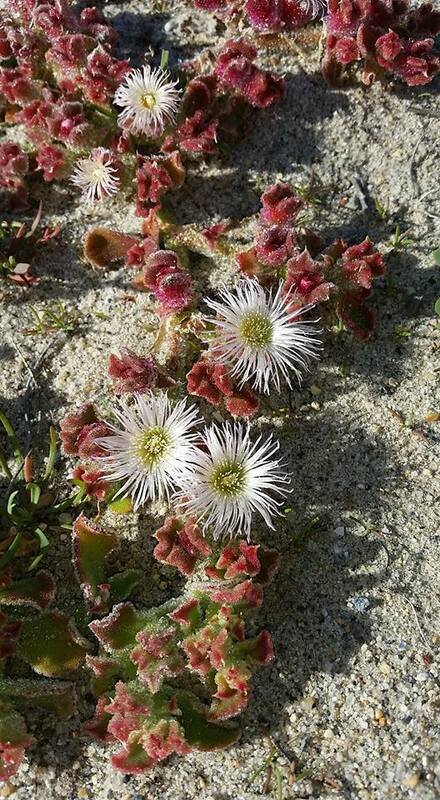 Native to quartz patches in the Western Cape of South Africa. 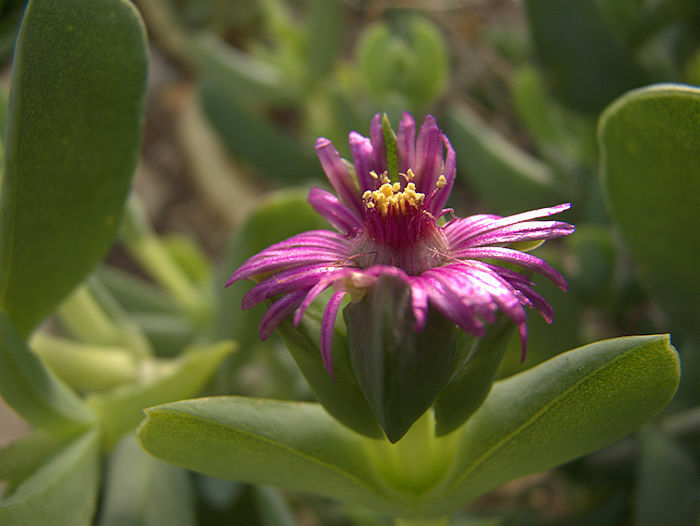 The genus Carpobrotus includes about 20 species of mat-forming succulent plants with fleshy angular leaves and large daisy-like flowers. Most species are native to South Africa but four originate in Australia and one in South America. Several species are naturalised in countries with mild climates and in some places are considered invasive, displacing native plants. However, they may be used as ground cover to stabilise land and provide drought and fire resistant vegetation. The reddish-green stems of this creeping succulent plant support clusters of fleshy triangular slightly curved leaves with serrated margins near their tips. In early Summer large yellow or pink daisy-like flowers appear, followed by large green capsules which can be pickled or turned into jam, hence the common name. 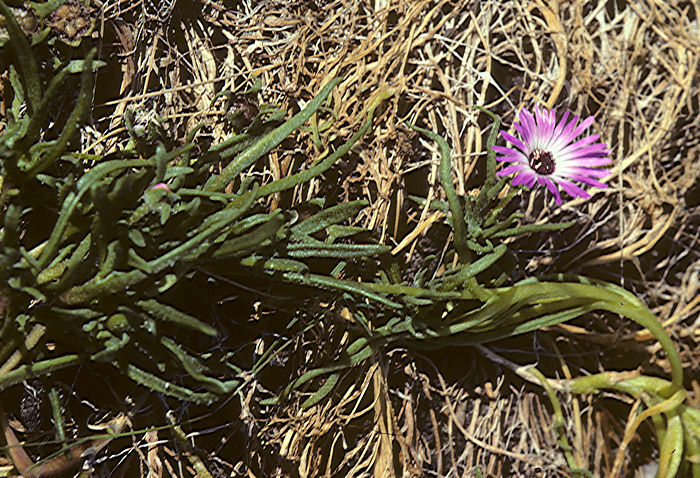 Native to coastal margins spreading inland in the Northern Cape, Western Cape and Eastern Cape of South Africa. 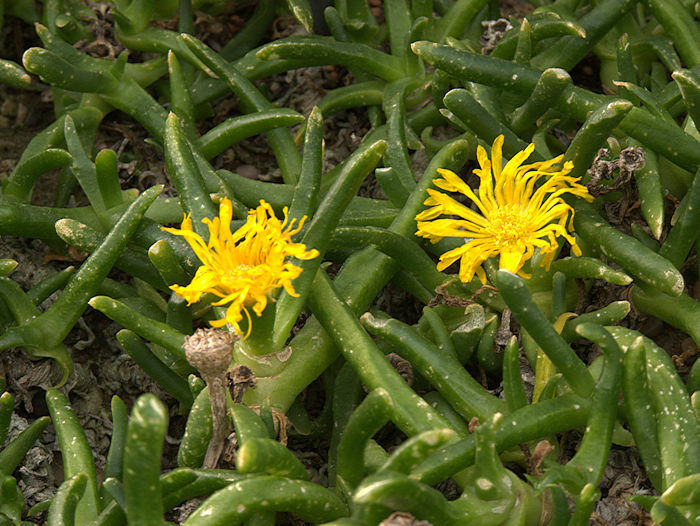 This invasive plant is naturalised along coastal margins in many mild climates. 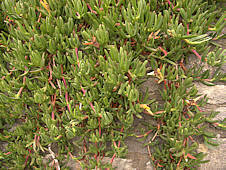 Large areas of the South coast of England and the Channel Islands are infested with Carpobrotus sp. and freely-produced hybrids. 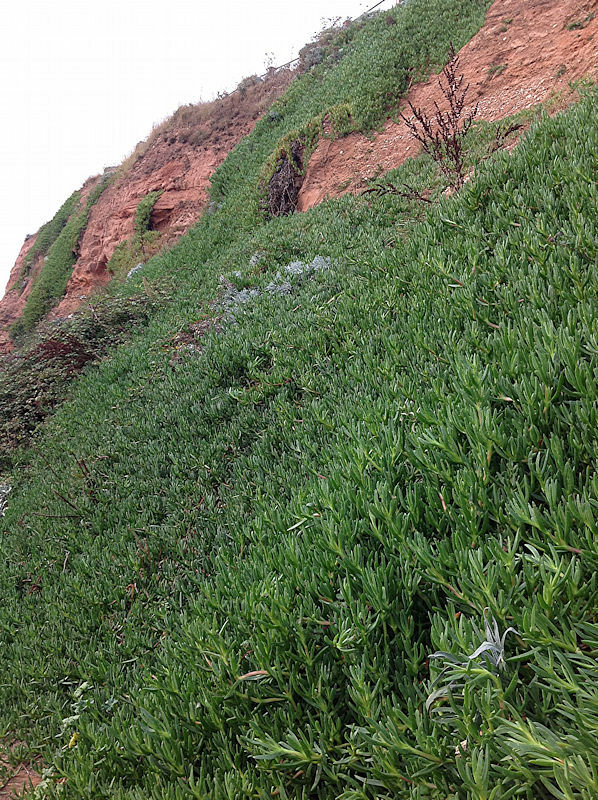 Left: colonisation of cliffs at Budleigh Salterton, Devon, England. 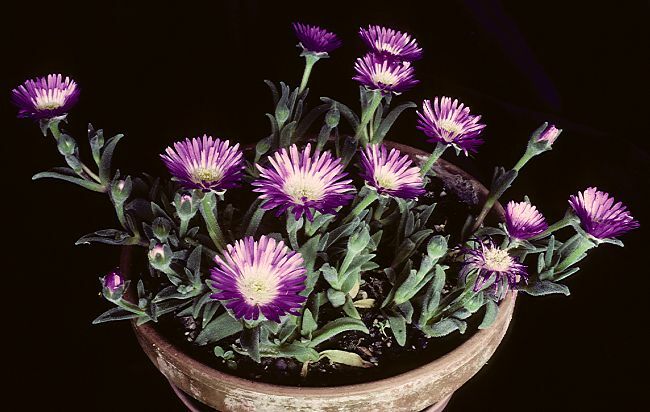 Despite its lush growth in nature, I find it quite challenging to grow Carpobrotus edulis in a pot as the sprawling stems tend to spread outwards while the centre withers. Tolerates a very light frost but no more. 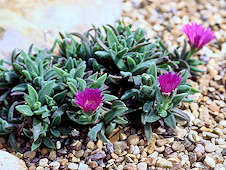 Above: The similar but slightly smaller species, Carpobrotus chilensis has magenta flowers 1.5 to 2.5 inch in diameter and similar fleshy seed capsules to C. edulis. Photo. Near Canford Cliffs, Dorset. 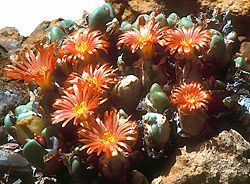 The genus Carruanthus includes two or three species of mat-forming Mesemb. 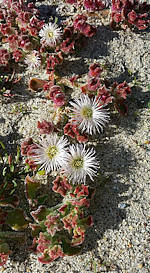 with fleshy, toothed pairs of leaves and flowers and fruit on long stalks (unlike those of the similar Faucaria). Roots are also fleshy. Yellow flowers are produced in the Spring. Native to the Eastern and Western Cape Province of South Africa. Grows in shade in its habitat. Grows in full sun in its habitat. Name: Greek cheiridis = sleeve + opsis = similar to, referring to the old, withered leaf pair forming a sheaf around the new leaf pair during Summer dormancy. 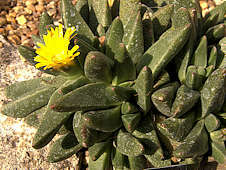 This genus includes around 100 species, of compact, clumping plants with elongated, opposite fleshy grey-green succulent leaves with a triangular cross-section and velvety surface. The single daisy-like flower may be cream, yellow, orange, red or purple. 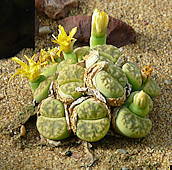 The genus is distributed from Namaqualand of the Western Cape Province, South Africa into Namibia. Most species experience Winter rainfall. This succulent plant has two pairs of 3-angled, pointed blue-green leaves covered with tiny translucent dots. The plant clumps up with age. The solitary flowers are yellow. Native to Namibia and Northern parts of the Western Cape Province, South Africa. Syn. 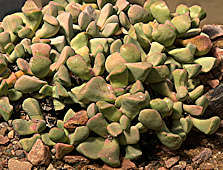 Cheiridopsis cigarettifera Berger 1910 This succulent plant forms a cluster of elongated angular leaves with pointed tips. The scented flowers are yellow. 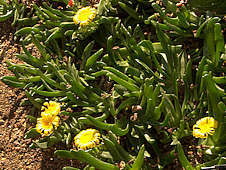 Native to Namaqualand and Northern parts of the Western Cape Province, South Africa. 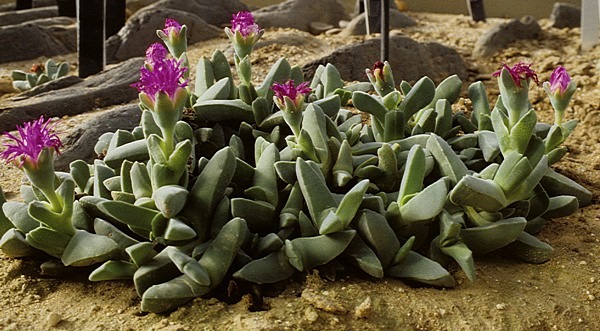 This succulent plant forms a cluster of elongated angular leaves with pointed tips. The large daisy-like flowers are cream to yellow. Native to Namaqualand of the Western Cape Province, South Africa. 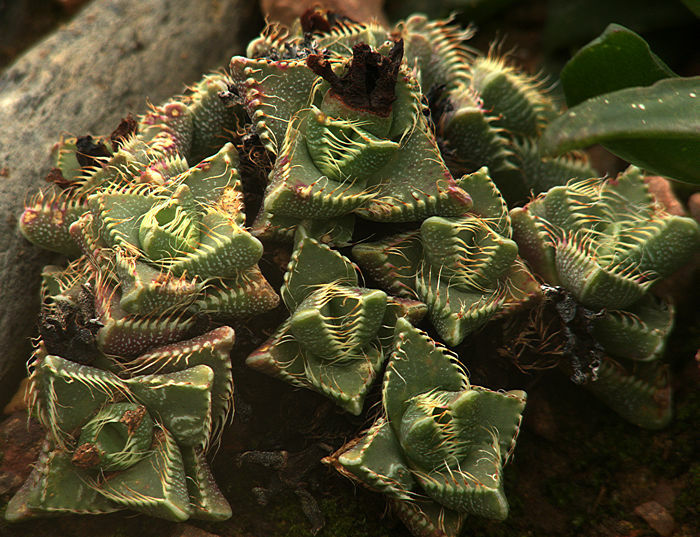 This succulent plant forms a compact cluster of angular leaves with pointed tips. Flowers are red to purple. This genus consists of 88 species, with many synonyms, of dwarf succulent plants with a single fleshy body composed of two leaves partly or entirely fused along their centres. Depending on the degree of fusion plants may have a bilobed or spherical appearance. The upper leaf surface may have transluscent windows and may be smooth, rough or pubescent. The leaf colour varies from blue-green through green to brown and red. 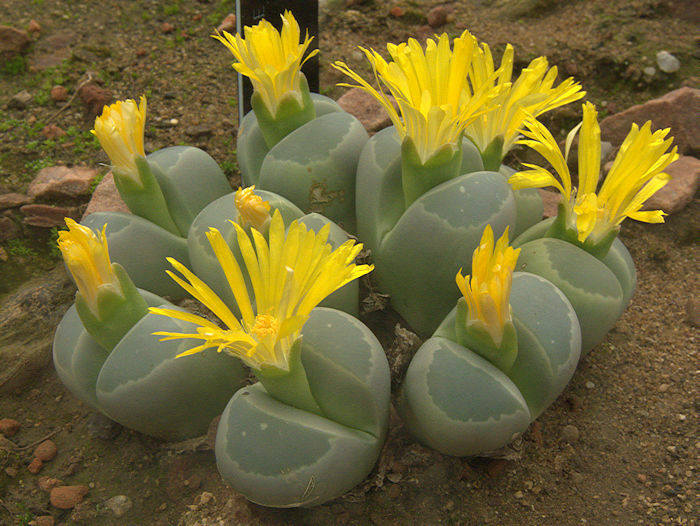 Some species of Conophytum produce many stems and leaf pairs, forming a compact cushion while others are solitary. Stems may develop two leaf pairs when overwatered in captivity or following heavy rain in their habitat. However, it is more usual for the older leaf pair to shrivel and form a membrane around the developing second leaf pair. Flowers are white to yellow, orange, pink, and purple. Native to central and Western South African and Namibia. 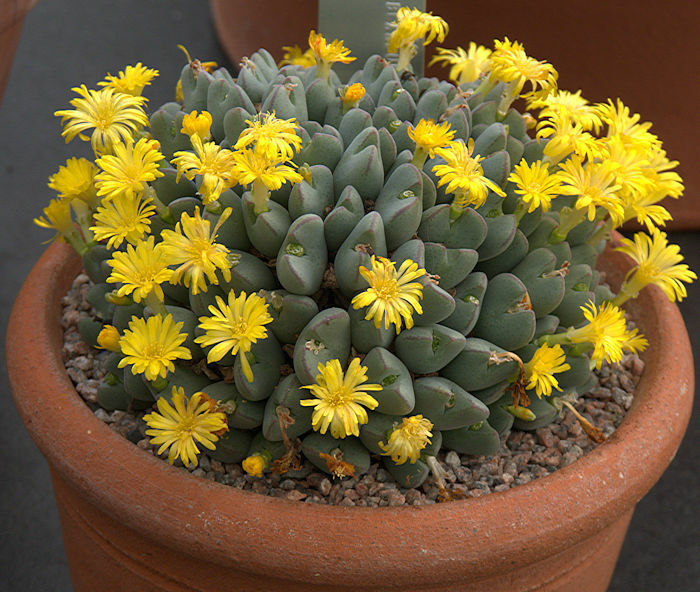 This free-flowering genus is popular among collectors of succulent plants as a substantial collection can be housed in a small area. Selected forms have been developed, especially in Japan, to emphasise particular charactristics of a plant e.g. squareness. 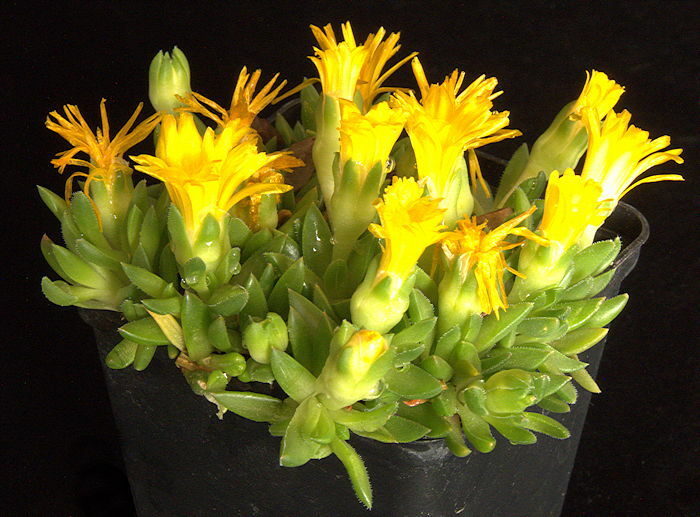 Conophytums are mainly Winter growers but watering can be started in mid-Summer. 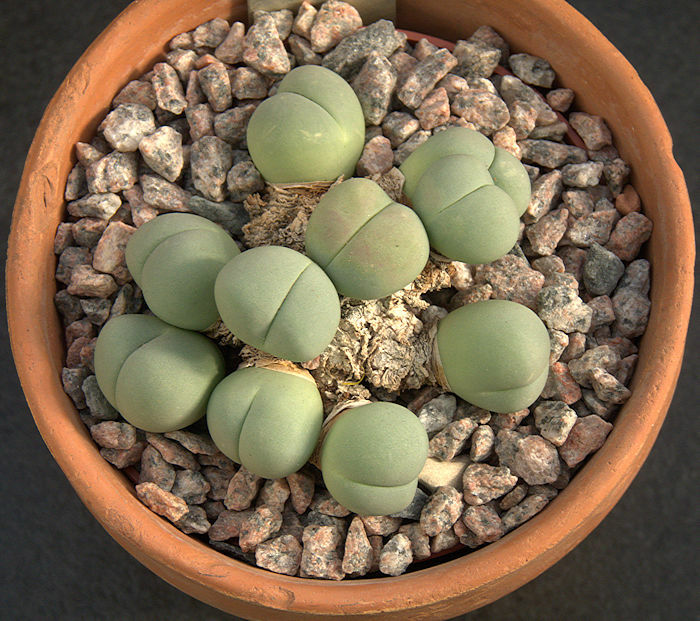 This is the type species of the Biloba group of Conophytum, named for their fleshy two-lobed succulent bodies. In this robust species, the tips of the lobes are tinged with red or purple and the showy flowers yellow to orange. In some forms, the plant body is spotted. Native to the Northern Cape of South Africa, covering a wide area with much variation in form, sometimes separated into sub-species. Above left: A cultivar with a particularly orange flower from Holly Gate Cactus Nursery. 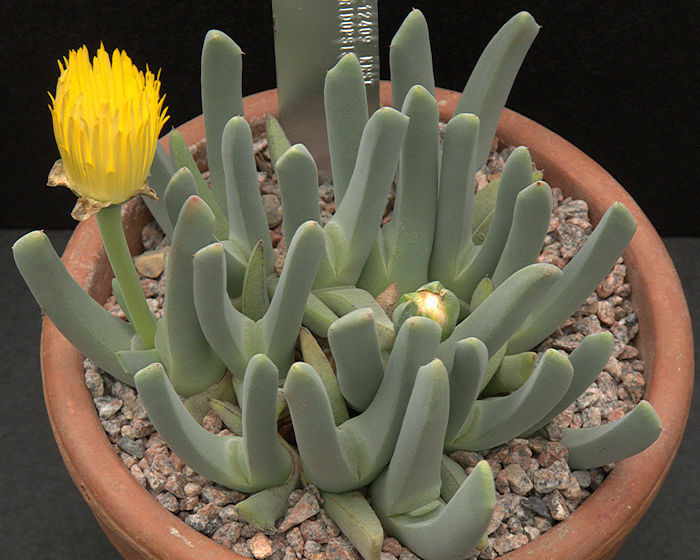 Above right: Labelled Conophytum blandum but clearly not that species as it should have pale purple flowers. The small plant bodies are almost spherical with a minimal groove between the opposite succulent leaves. The leaf surface is covered with tiny dark spots. Flowers are white. Plants may form large clumps. Native to elevations of up to 3800 ft in the North-Western Cape of South Africa, growing in crevices in rocks. 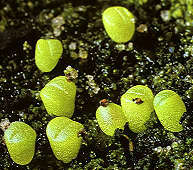 This species has small (1 cm) rounded, slightly elongated fused pairs of grey-green leaves whose surface is covered with tiny darker spots. 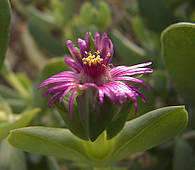 In late Summer or Autumn magenta daisy-like flowers are produced. Native to the Van Rhynsdorp area, North-Western Cape of South Africa. 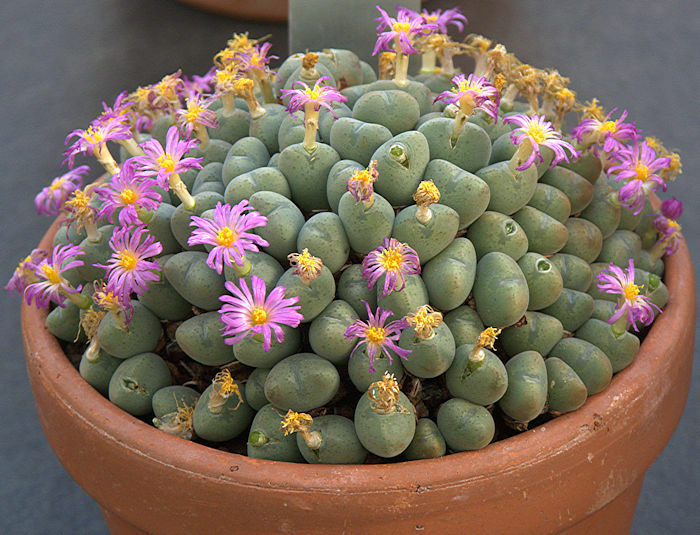 Name: Latin velutinae = velvety The small heart-shaped grey-green succulent plant bodies are speckled with a few darker dots. There is a minimal groove between the opposite leaves. 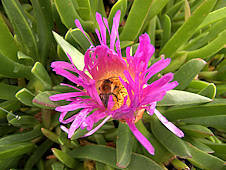 Flowers are magenta with yellow stamens. Name: Greek delos = open, apparent + sperma = seed, referring to visible seeds in the open seed capsule. 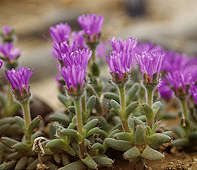 This genus include 170 species of creeping succulent plants to dwarf succulent sub-shrubs, sometimes divided into the three three genera Delosperma, Hartmanthus and Corpuscularia. The genus is spread across Africa into Arabia, Madagascar and Réunion island. Most species are from Summer rainfall areas and cover a range from sea shore to high mountains. 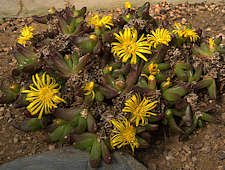 Some alpine species, especially the mat-forming yellow-flowered Delosperma nubigenum from Lesotho, are half-hardy in a sunny position in very well-drained soil. Delosperma nubigenum and some other species are said to be deer-resistant. 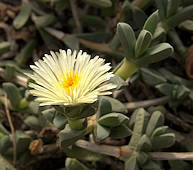 This species makes a freely-branching 16in tall sub-shrub with succulent grey-green leaves, slightly pubescent especially leaf margins and tips. The purple flowers have pale pink stamens with yellow anthers. Native to Uitenhage, South Africa. The pointed light-green leaves are pubescent. 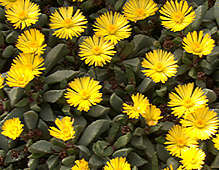 Bright yellow flowers are produced in early Spring. 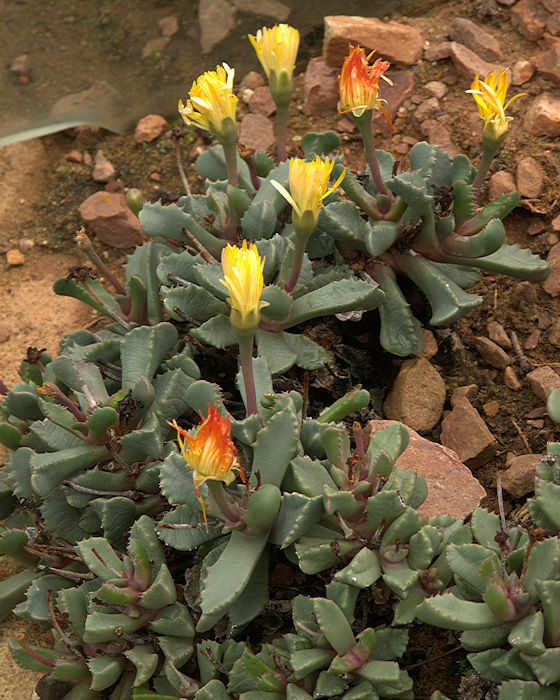 This dwarf alpine is native to high mountains (9800 ft) of South Africa, Lesotho and Swaziland and very cold hardy. This species makes a freely-branching 8in tall, sprawling succulent sub-shrub. The purple flowers have pale pink to white stamens with yellow anthers. 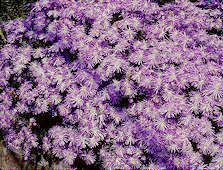 Native to mountains of South Africa, Lesotho and Orange Free State, mainly Summer rainfall areas. Half-hardy in a very well-drained sunny position. This shrubby Mesemb forms a sprawling clump of thin, woody stems, up to 18 in high. 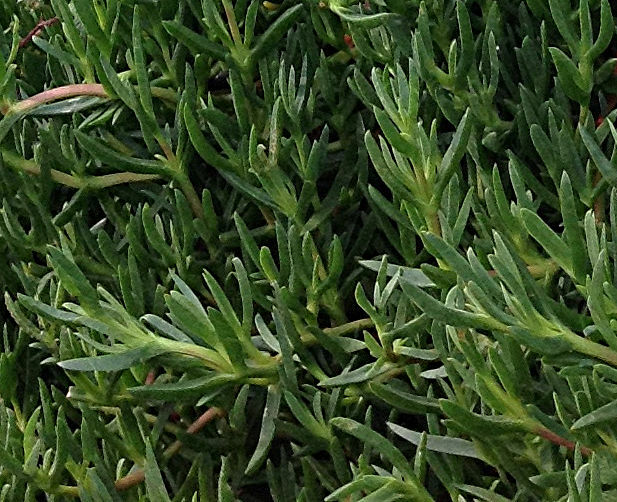 The younger stems and ovate succulent leaves are covered in tiny hairs which tend to rub off easily. Small white to yellow flowers are produced in the Spring. Native to South Africa. 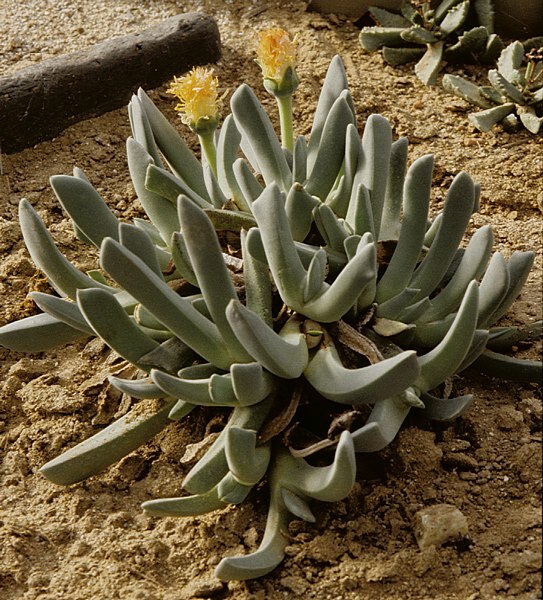 This species is a compact plant with ovate, smooth succulent grey-green succulent leaves. The white flowers have white stamens with yellow anthers. Native to cliifs at 2300 ft above sea level, Uniondale, South Africa. 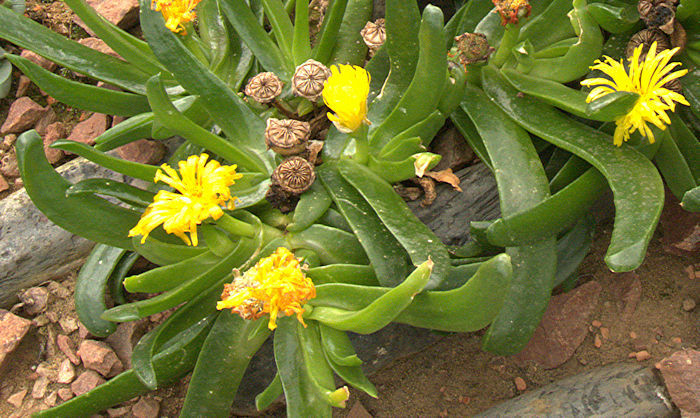 This succulent plant is native to Basutoland. Bedded out in the Rockery at Royal Botanic Gardens Kew, where it appears to be hardy. 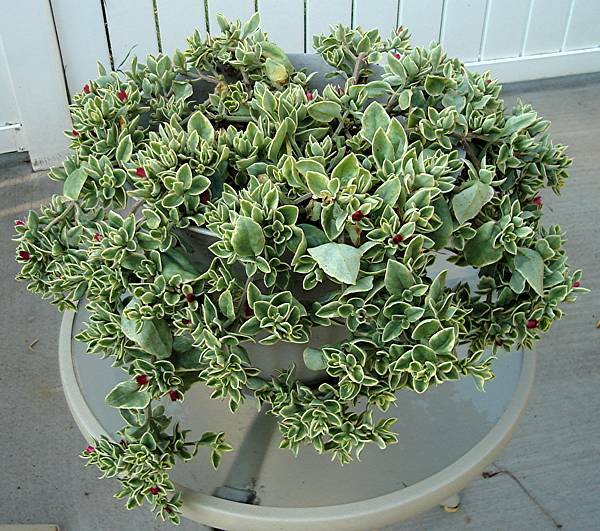 This succulent plant makes a densely-spreading mat of bright green rosettes formed from small triangular leaves. The bright yellow flowers appear in early Summer. 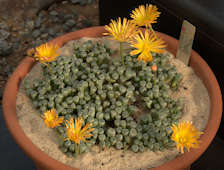 Native to mountains of Lesotho (Basutoland), South Africa, growing at altitudes of up to 3800 ft. Hardy in a very well-drained sunny position, even through an English Winter. 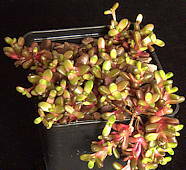 This dwarf species makes an attractive mat of deep-reddish green foliage. Flowers are white with yellow centres. 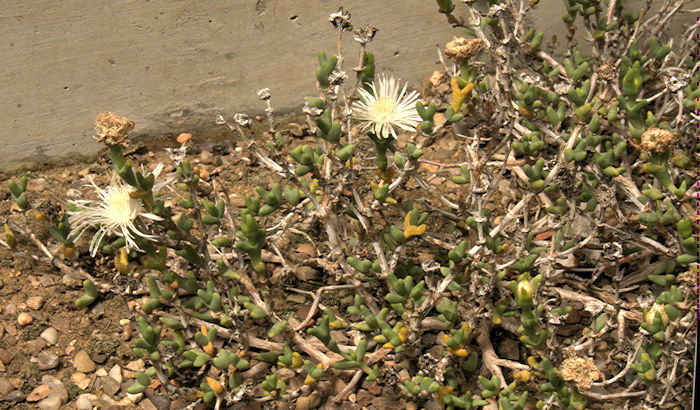 Probably a cultivar of Delosperma alpinum (S.A.Hammer & A.P.Dold 2003) native to altitudes of 8200 ft in the Amathole Mountains of the Eastern Cape of South Africa. Said to be cold hardy in a sunny well-drained position or cold frame. 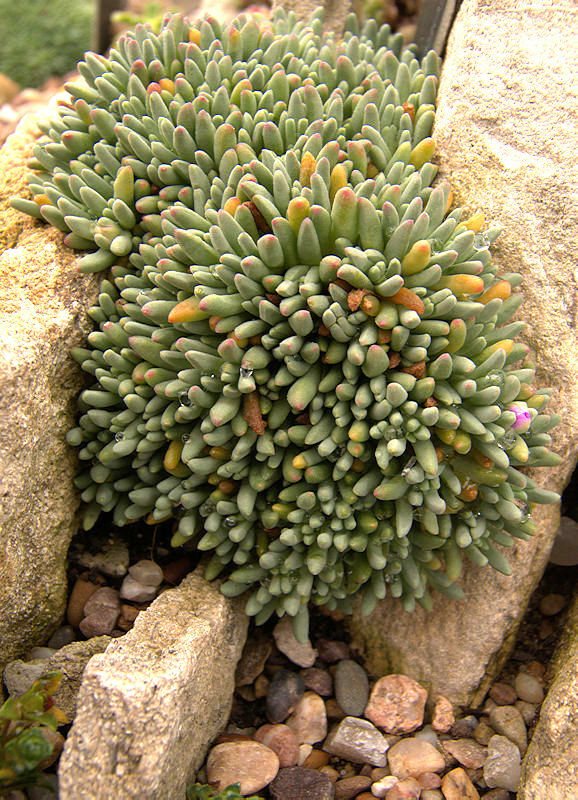 This alpine succulent plant forms cushions of tiny blue-green cylindrical leaves. Flowers are shades of magenta. 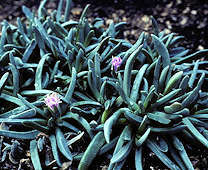 Native to gravely soils of Komsberg Mountains of Cape Province of South Africa where it experiences Winter rainfall. 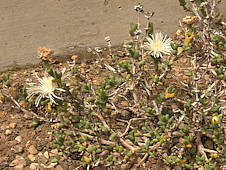 This species makes a freely-branching 8in tall sub-shrub with grey-green succulent leaves, slightly pubescent especially leaf margins and tips. The bright purple flowers have white stamens with yellow anthers. Native to grasslands in the South African Transvaal. This species is very free-flowering with a long flowering period. If you grow just one Delosperma, make it this one. A shrubby Mesemb. 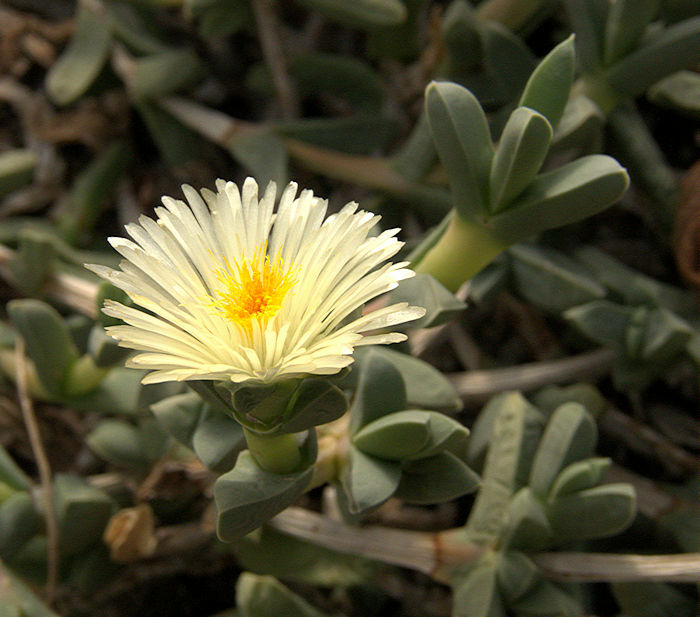 with succulent angular blue-green leaves and a white to pale yellow flower. Native to the Eastern Cape Province of South Africa from Port Elizabeth to Grahamstown. 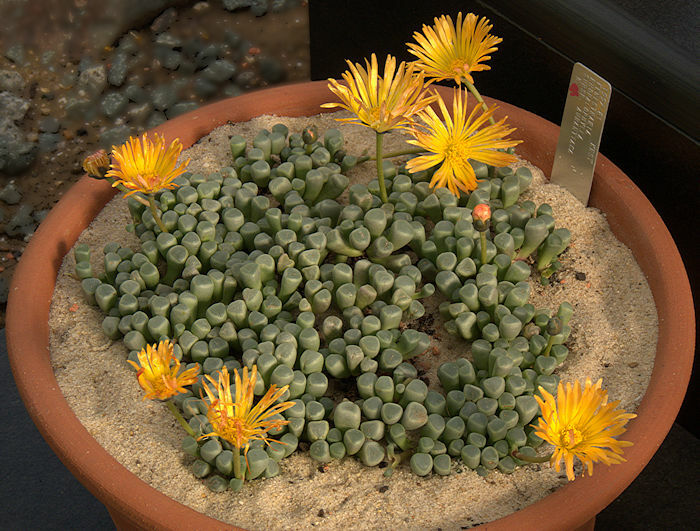 A genus with 6 species of fleshy trailing to erect succulent annuals with solitary, large, brightly coloured flowers, usually with dark centres. Native to the Winter rainfall areas of South Africa including Namaqualand, North and Western Cape. As annuals, Dorotheanthus species would not usually be seen in succulent plant shows, but their bright flowers would be welcome in the garden. 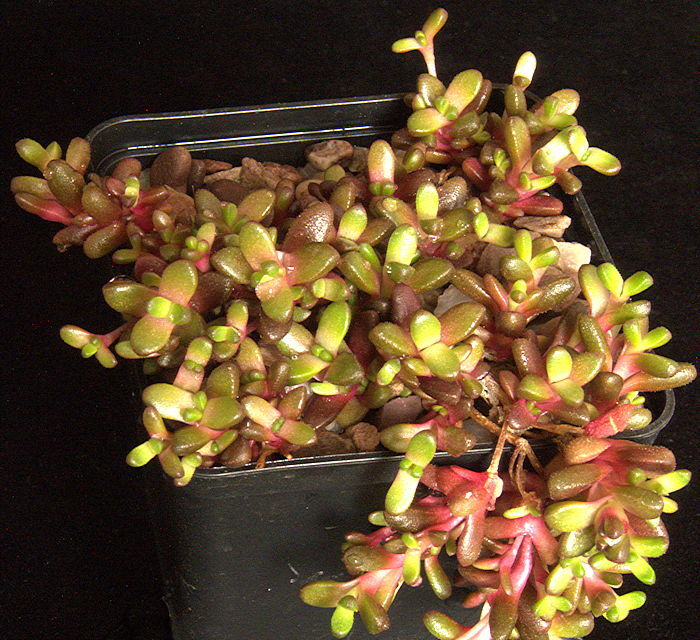 This upright to trailing succulent plant has simple, linear, fleshy leaves and during the Summer produces solitary crimson, pink or white flowers with a dark central disk. Native to South Africa, Lesotho and Swaziland. Name: Greek drosos = dew + Anthos = flower, referring to sparkly water cells on the leaves, resembling dew. 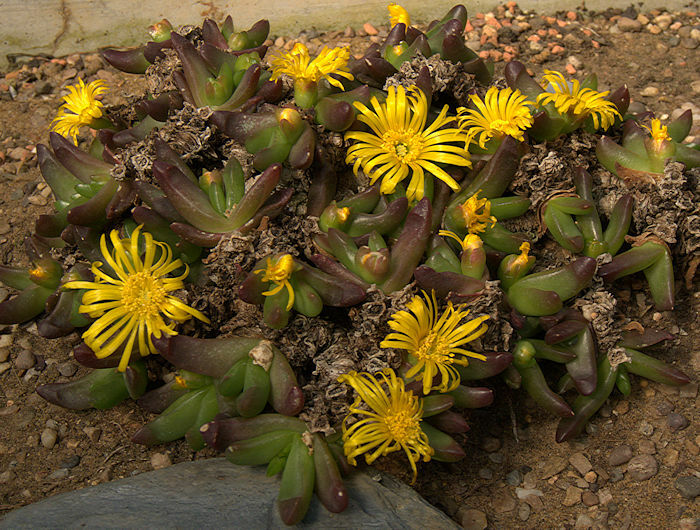 A genus of around a hundred small creeping succulent plants and shrublets, native to South Africa. Many species produce showy displays of scarlet, yellow or orange flowers and are popular garden plants for Mediterranean climates. 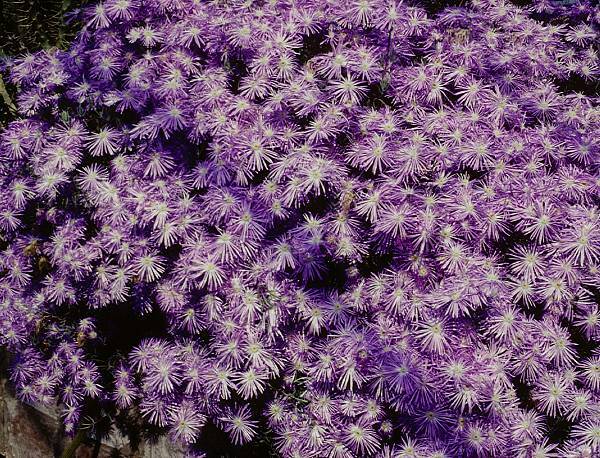 Name: Latin hispidum = spiky A mat-forming perennial with small succulent pubescent leaves and purple flowers with yellow centres. Native to altitudes of 5000 ft in South Africa and Namibia and quite hardy. Name: Latin bracteola = small bract + e- = without, incorrectly suggesting an absence of bracteoles. 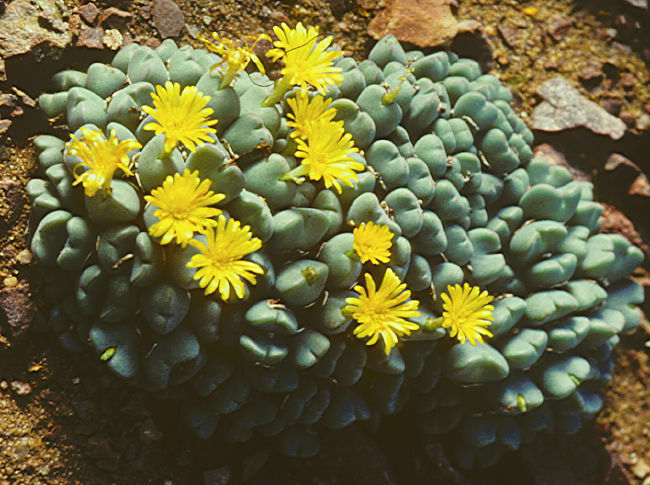 Four species of small clumping succulent plants with a stout rootstock or tap-root. Short stems carry alternate, lanceolate leaves. The white to purple daisy-like flowers have a dense central cone of white stamens with yellow anthers. The genus is distributed in central Namibia, Northern and North-West Cape Privince and central South Africa. In their habitat, plants often grow partly submerged by wind-blown sand. 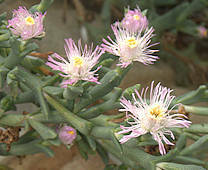 is an evergreen plant with lanceolate silvery-grey succulent leaves with a triangular cross section, arranged alternately along the short stems. 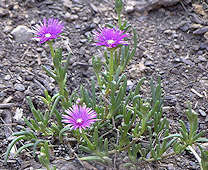 The small solitary daisy-like flowers are lavender or white. The most northenly-distributed species, native to Namibia. The genus formerly included 37 species, but a recent revision reduced this to 6 species. 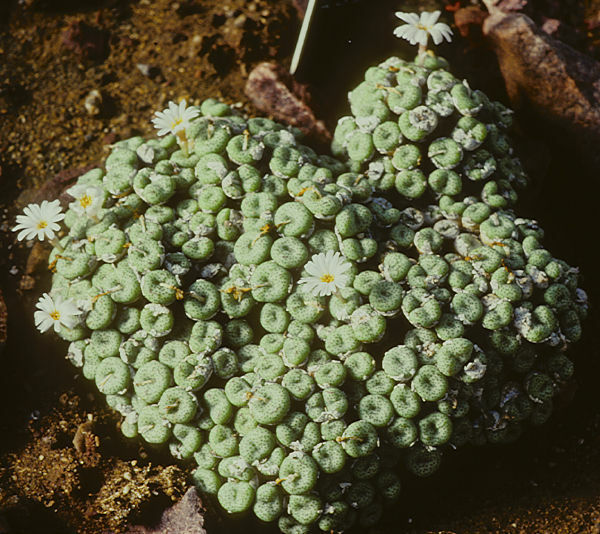 The tight succulent rosettes are formed from several opposite pairs of thick, triangular, light-green leaves whose upper margin is furnished with long, soft spines. Leaf surfaces may be mottled or pustulate. In late Summer golden-yellow or white flowers are produced but unlike those of the rather similar Carruanthus have no stalks. Native to the Eastern Cape, Little Karoo and Great Karoo of South Africa. 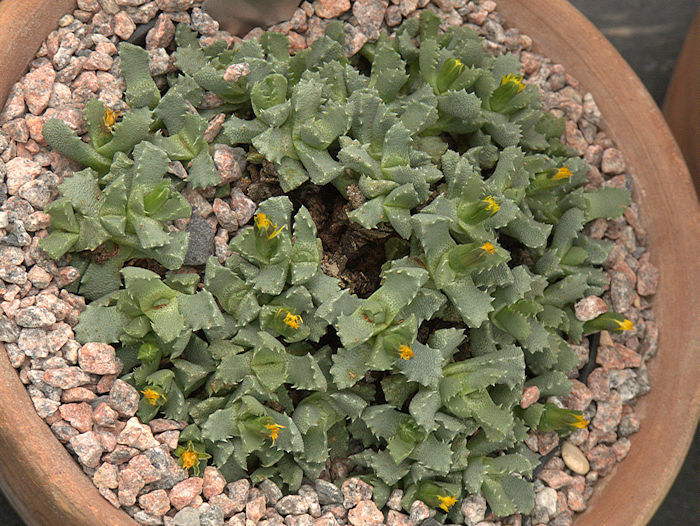 Some forms in cultivation may be hybrids selected for particularly warty leaves and prominent teeth. This variable species of succulent plant includes many synonyms formerly classed as separate species. Leaf surfaces have some white pustules and there are marginal teeth. This is the classic "Tiger Jaws" plant with particularly prominent marginal teeth and pustulate leaf surfaces. Native to South Africa. A relatively tolerant succulent plant seen on many window-ledges. 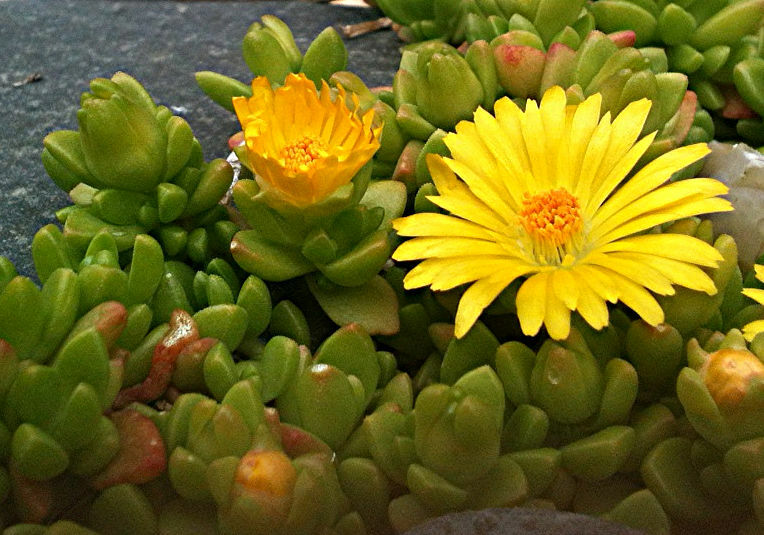 This tiny succulent plant has rosettes with up to 6 to 8 leaves. 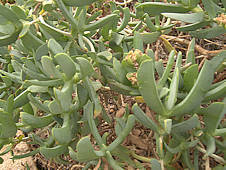 The light grey-green succulent leaves have distinctive white keels and margins with up to 4 marginal teeth formed as white cartilaginous protrusions, but may have none. Native to the Cape of South Africa. Name: Latin fenestra = window, refering to the windowed leaf ends. 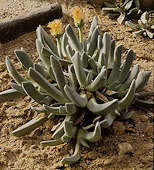 From fleshy roots and short stems arise numerous grey-green conical succulent leaves with flat, windowed ends. The leaf surface is smooth and waxy. These succulent plants grow to form large mats. Relatively large daisy-like yellow or white flowers are produced on long stems. This monotypic genus is distributed along the coastal South African Richtersveld into Namibia, generally within 25 miles of the sea. In their habitat, plants often grow in sandy or calciferous soils, partly submerged by wind-blown sand with only the windowed ends exposed. They experience low <100 mm annual rainfall. Gibbaeum N.E. Brown 1921 (Afrikaans: volstruistone = ostrich toes)Name: Greek gibba = hump, referring to the 2 leaves of each pair which differ in size and shape. The 26 species in this genus are somewhat varied in form. 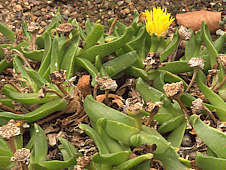 They consist of pairs of generally unequal pairs of succulent leaves, fused into bodies with a cleft between the two halves to a variable extent. The leaf surfaces are often velvety from the presence of minute hairs. The bodies form dense clumps, supported by underlying woody stems and rootstock. The flowers produced in late Winter to Spring are on short pedicels and are white, pink to dark purple, never yellow. Native to the Little Karoo of the Western Cape of South Africa where they experience both Winter and Summer rainfall. Often found associated with quartz pebbles. The leaves are relished by ostriches as a source of water during drought. This small-growing species forms clumps of blue-green plant bodies consisting of a woody stem with two unequal, slightly keeled succulent leaves at its end. The leaf surface is covered in minute hairs. The solitary flowers are pink with yellow stamens. Native to a small area of the Little Karoo near Vanwyksdorp. Named for: Dr. Francis Harold Rodier Heath (1874-1940) English collector of Mesembs. 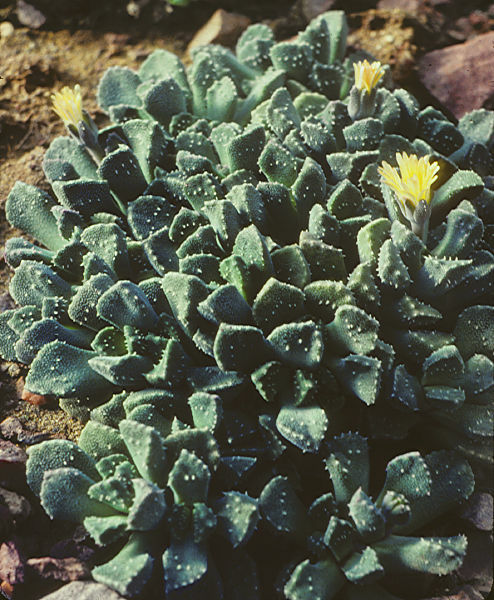 The compact globose bodies of this species are formed from two unequal blue-green succulent leaves fused together, with a central groove delineating their junction. Old plants have stems covered with the remains of dead leaves. Flowers are pale purple or white. Native to the Little Karoo of South Africa. 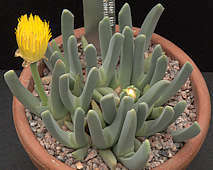 Name: Latin velutinae = velvety In this species the two keeled succulent leaves are strap-shaped although basally fused, with a spreading appearance. Flowers are white to purple. The 17 species of clumping succulent plants consist of opposite pairs of soft, lax, strap-shaped leaves forming loose rosettes or arranged on a single axis (distichous). 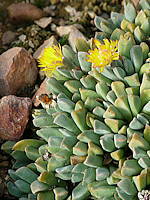 The succulent foliage of the more lax species is easily damaged and can become unsightly. Cultivation seems to exacerbate untidy growth. The large yellow flowers are generally produced in Spring or Autumn reflecting the peak exposure to the sparse rainfall, but may appear at any time in response to watering. Native to the Southern Cape interior from the Little Karoo towards the Great Karoo. 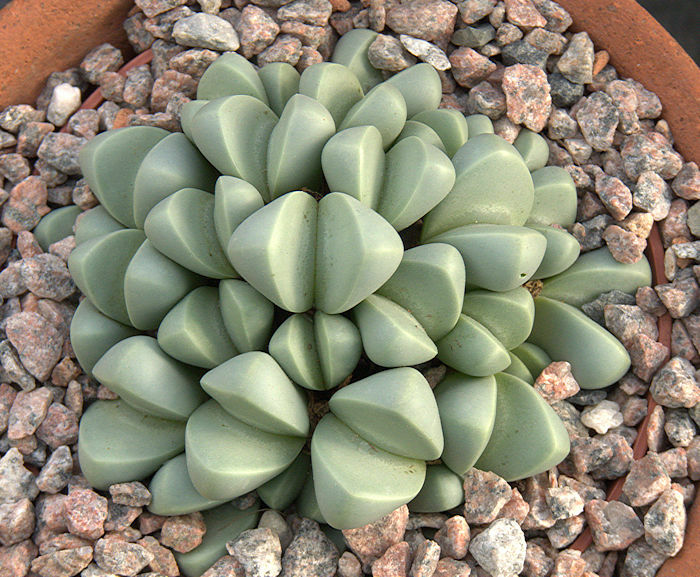 A mat-forming succulent plant whose rosettes are formed from elongated, spatulate green succulent leaves with pointed tips. The flowers are bright yellow. Native to the Western and Eastern Cape of South Africa. 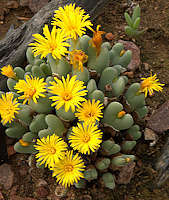 Name: Latin pygmaeus = dwarf This dwarf form produces several opposite pairs of distichous, rounded, tongue-like dark-green succulent leaves on each branch of the stem, clumping up to form a spreading mat. The large, yellow, daisy-like flowers are very showy. Native to the Western and Eastern Cape of South Africa. If overwatered, the leaves elongate spoiling the dwarf habit. 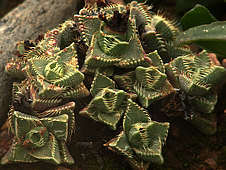 A mat-forming succulent plant whose rosettes are formed from pairs of lax, strap-shaped green succulent leaves with pointed tips arranged on a single axis (distichous). The flowers are bright yellow. 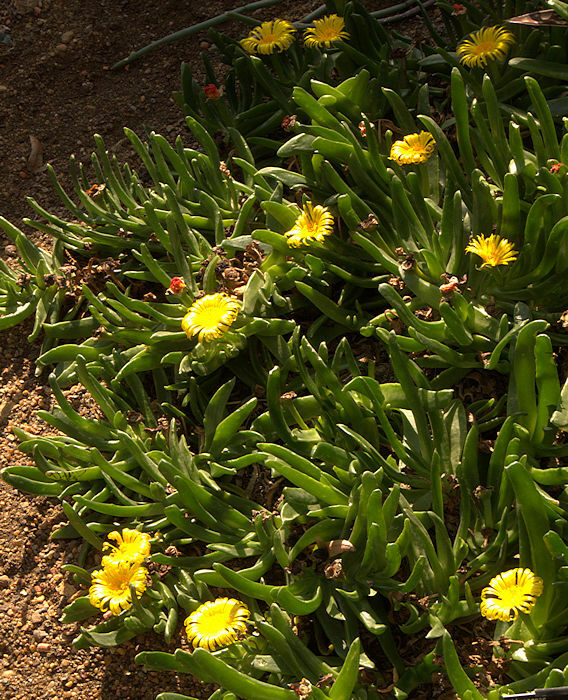 Native to the Eastern Cape of South Africa, where it grows among quartz pebbles. 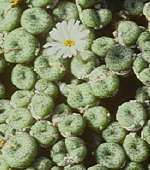 A mat-forming succulent plant whose rosettes are formed from elongated, cylindrical green succulent leaves with pointed tips. The flowers are bright yellow. 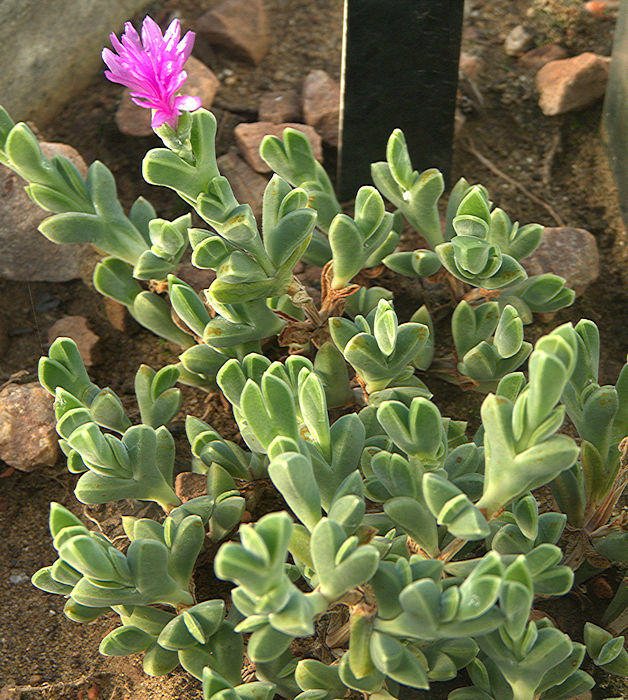 Native to the Western Cape of South Africa, where it grows among quartz pebbles. A mat-forming succulent plant whose rosettes are formed from elongated, keel-shaped green succulent leaves with pointed tips arranged on a single axis (distichous). The flowers are bright yellow. Native to the Calitzdorp region of the Western Cape of South Africa. The genus includes 30 species of mat-forming succulent plants with soft, triangular shaped leaves, sometimes roughened with small, slightly-raised dots on their upper surface and with notched or flattened tips. The outer epidermis contains a thin layer of crystals of oxalate or none. In some taxonomic treatments, Hereroa is merged with Bijlia. 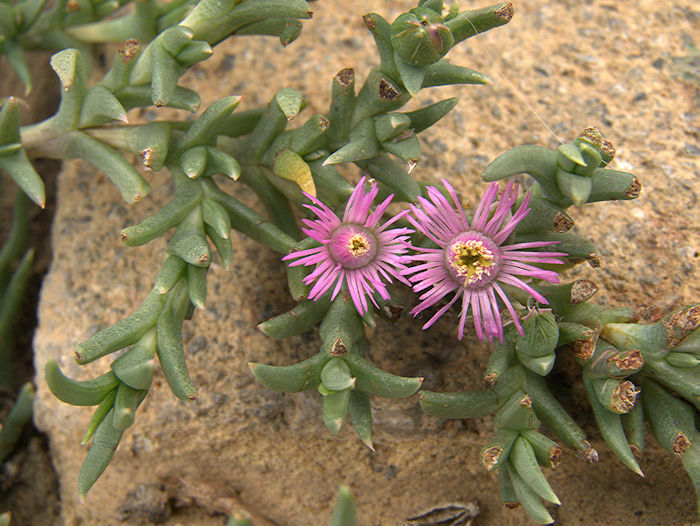 A dwarf Mesemb with cylindrical lanceolate succulent leaves, whose surface is patterned with many tiny raised dots. The small flowers are yellow to orange. The 227 species include creeping succulent plants to succulent sub-shrubs. 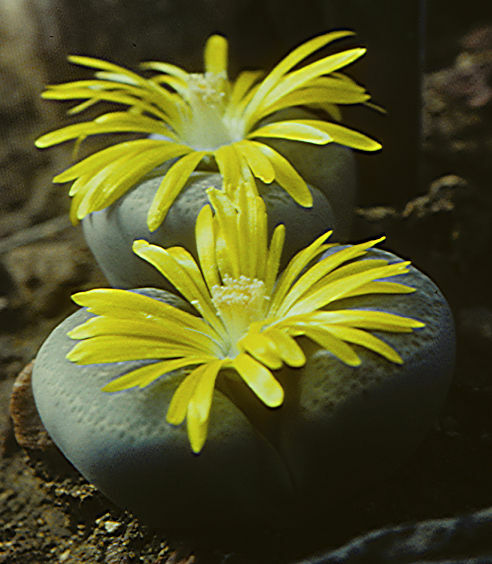 The smooth stems support opposite pairs of smooth, elongated cylindrical or triangular succulent leaves which are free or slightly fused at their base. Leaves may be up to 2 in long. The white, yellow, orange, red or purple flowers occur singly or in small clusters and can be extremely showy. The glossy petals catch the light and many species have bicoloured flowers. Native to a band around the coast of the Western and Eastern Cape Province and as far North as Southern Namibia. 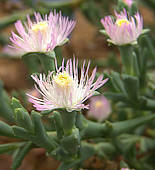 Lampranthus is a common succulent plant in gardens in warm climates. 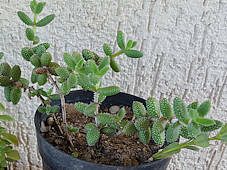 Name: Latin aureus = golden This small shrubby succulent plant has reddish stems bearing pairs of angular dark green leaves fused at their base. Bright orange or yellow flowers are produced throughout the Summer, followed by woody fruit capsules with five locules. 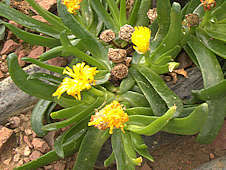 Native to acidic sandy soils and granite outcrops along the Southwest and West coast of the Western Cape of South Africa. This species is widely-cultivated for the horticultural trade. 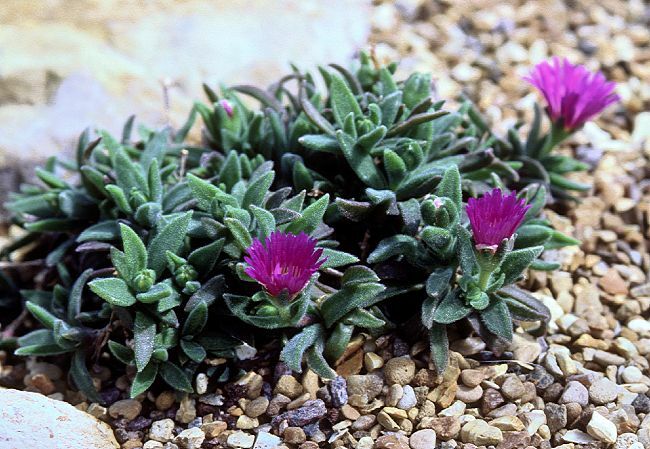 Name: Latin deltoides = triangular A dwarf sprawling, shrubby plant with pairs of ovate, toothed, 3-angled grey-green succulent leaves. The small 0.5 inch purple, almond-scented flowers have a central cone of staminode filaments surrounding the stamens. Native to sandstone mountains just North of the Cape peninsula in the South-Western Cape of South Africa where it experiences Winter rainfall. 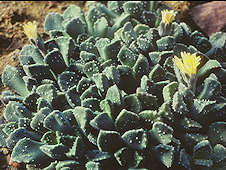 This species is an erect sub-shrub with pairs of elongated, cylindrical, blue-green succulent leaves fused at their base. The large flowers are shiny pink, purple or white. Native to the Little Karoo and the region of the Karoo from Worcester to Robertson, enjoying mainly Winter rainfall. The plant grows readily from cuttings, which should be used to regenerate old, woody plants. 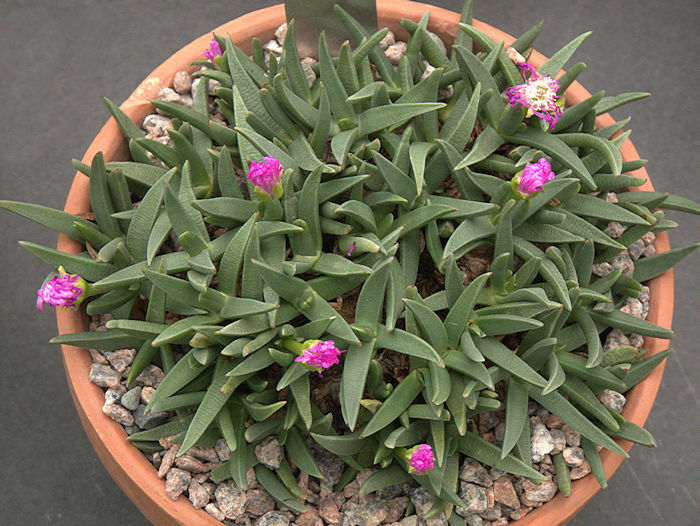 The genus includes 36 species of dwarf, stemless succulent plants, often seen partly sunken into the soil. The highly-succulent plant body consists of a pair of fleshy leaves fused together into a conical structure with a flat top which may be patterned with grooves or windowed and with a groove between the two leaves. Old leaves shrivel and dry into a sheaf surrounding the new developing plant body. 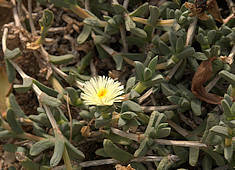 The usually-solitary daisy-like flower emerges in the Autumn to early Winter from the groove between the two leaves and may be white or yellow or occasionally orange. 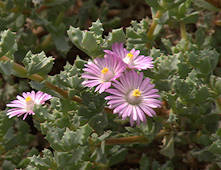 Native to central and Western South Africa into Namibia and Botswana, usually growing in gravelly flats and low hills. 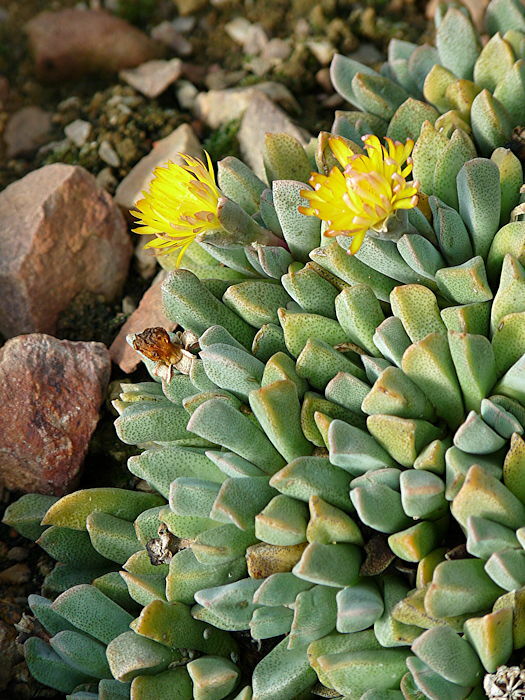 These succulent plants are the classic "living stones" and popular with growers as a varied collection with different leaf markings and colours can be maintained in a small area. Some particularly attractive selected cultivars are in circulation among collectors. They should be watered from late Summer into the Autumn. 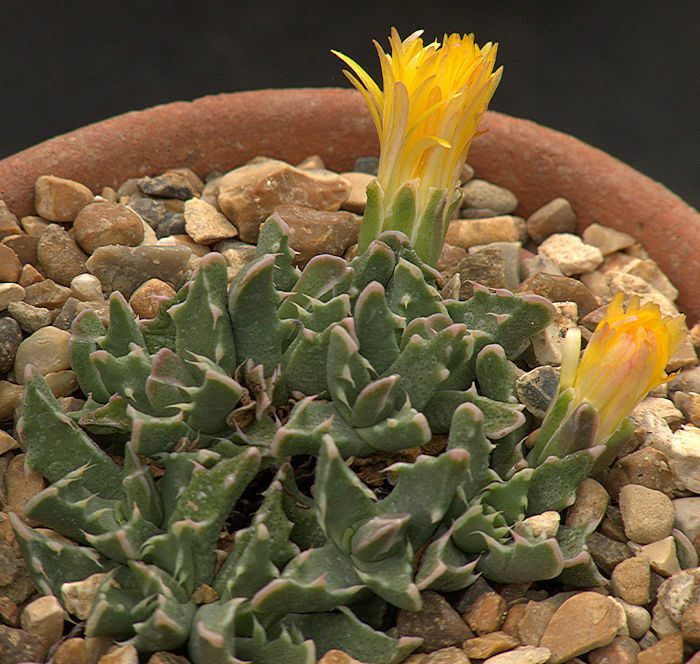 Named: Latin sulphurea = sulphur coloured The two succulent green leaves are separated by a deep fissure. Their top surface is yellowish-green marbled with irregular darker translucent windows and some darker dots. Flowers are bright yellow. This is a Japanese cultivar discovered in a batch of seedlings and is not known in nature. It comes true from seed. Named: after the Karas mountains, Latin bella = beautiful Shown here as newly-germinated seedlings. Named for: Owen Leslie who discovered these succulent plants in 1908. 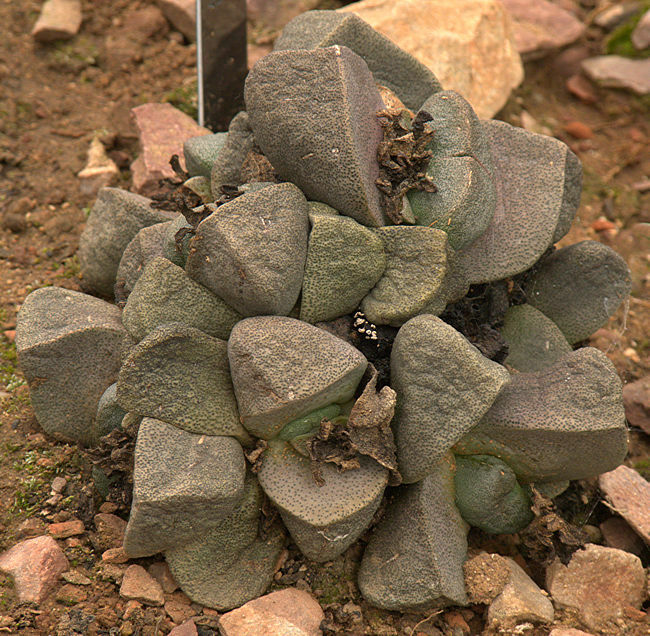 The top of the mature greyish plant succulent body is marked with an intricate greenish windowed pattern with many mini-windows and the surrounding surface varying in colour from grey to rust-browns and green. Native to South Africa and South-Eastern Botswana. Numerous selected cultivars have bodies ranging from green to brown. Flowers are yellow or white. Named for: H.A. Horn who discovered these succulent plants in 1964. Name: terricolor = earth coloured, referring to the epidermis The succulent plant body is deeply cleft between the two leaves and the top marked with channels, islands and numerous small dots (windows). Numerous forms have been selected with differently coloured plant bodies in shades of greys, browns and green. Flowers are yellow. 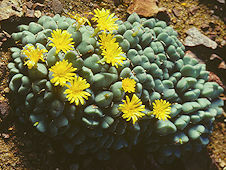 Native to the Eastern Cape of South Africa, generally growing almost buried with just their windowed faces showing at the soil surface, usually among pebbles of fine-grained sandstone. Named: Latin marmorata = marbled The two succulent leaves are separated by a deep fissure. Their top surface is variable but generally marbled with irregular pale blotches over darker translucent windows. Flowers are white. 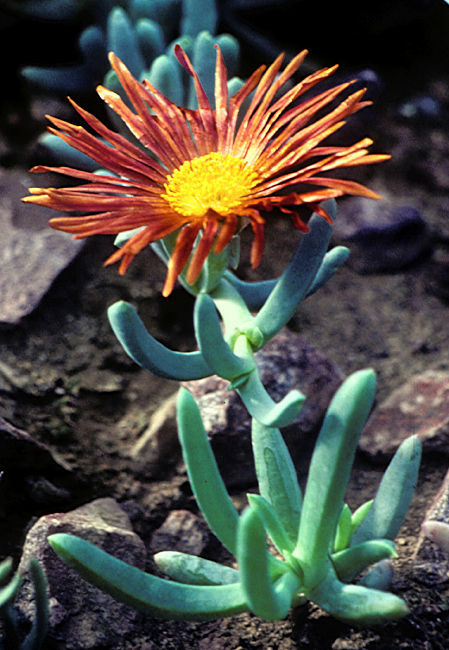 Native to the Little Namaqualand region of South Africa where it grows among quartzite pebbles. Named for: olive-green colour of the epidermis. The windows are completely clear or spotted with a few grey flecks. Flowers are yellow. Native to the Bushmanland area of South Africa around Aggeneys, Pofadder and Namies. Usually found among quartz outcrops. Name: Greek maleo = arm-hole + pherein to bear, referring to the stem continuing through the leaf sheath. 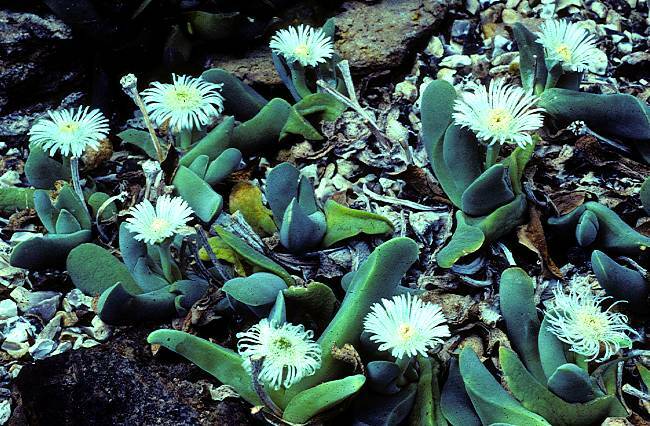 The 13 species in this genus range from creeping succulent mat-forming plants to upright succulent sub-shrubs. 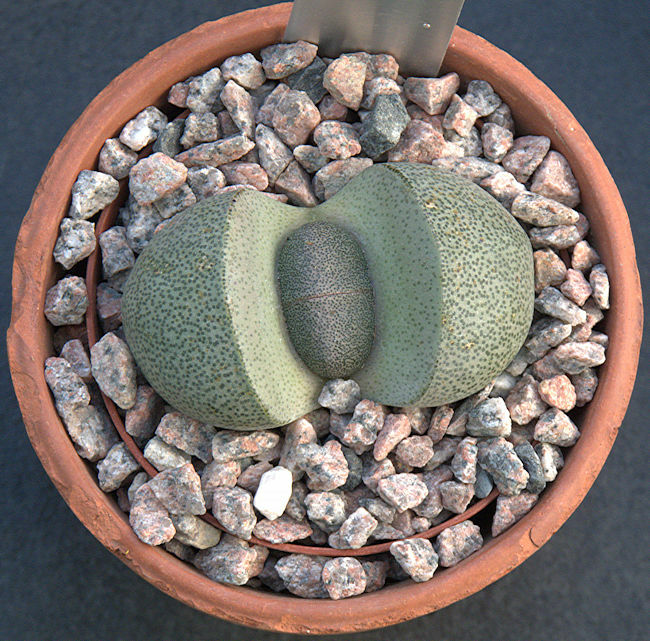 The fleshy, opposite succulent leaves have a cylindrical to triangular cross section and slight basal fusion. Leaves may be up to 2 in long with a smooth and extremely waxy surface. Flowers may be yellow to orange, reds and reddish-purple. The yellow stamens are often bearded. Widely distributed from Namibia through Namaqualand to the South African Cape. M. Herrei from the cold climate of Fauresmith is said to be cold hardy. 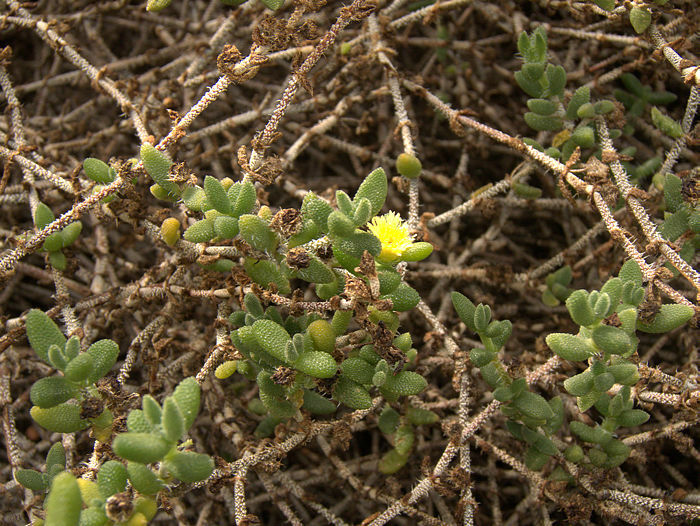 This is a shrubby, sprawling species with opposite pairs of angular glaucous succulent leaves. The large red to orange flowers have yellow stamens. Native to South Africa. This is an opportunist species that springs up rapidly after rain. This is either a variable monotypic genus or includes two rather similar species. 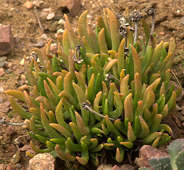 Plants have large carrot-like rootstocks from which arise a mat of somewhat variable lanceolate succulent leaves which may be thin or cylindrical. The small purple flowers produced during the Winter are on stalks. Petals may have a darker stripe running down their middle. Native to the Little Karoo of the Western Cape of South Africa. Water during the Summer. Branching tap roots support a mat of lanceolate succulent leaves and purple flowers on stalks. Native to the Uniondale district of the Western Cape. 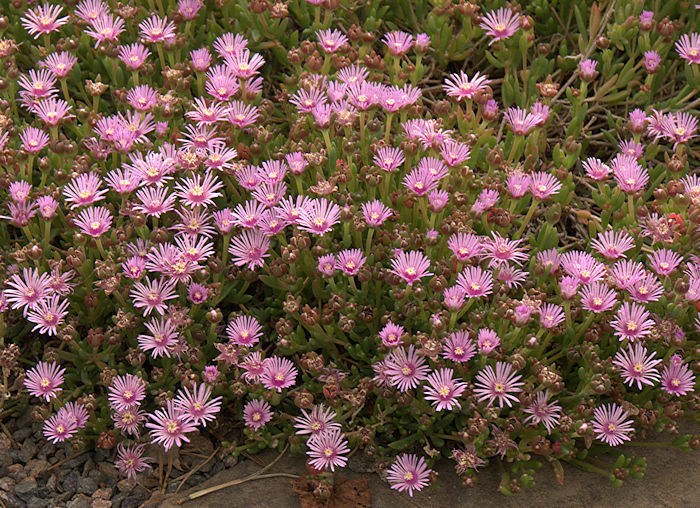 Native to the Eastern Cape, has thickened roots, narrower thickened succulent leaves and pinkish-purple petals. 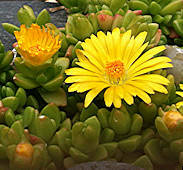 A small group of annual to perennial succulents, often with long-lasting brightly-coloured daisy-like flowers with diurnal opening and closing. Leaves have a sprkling appearance due to epidermal bladder cells on their surface. 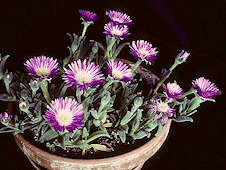 Mesembryanthemum was originally a large catch-all genus including as many as 130 species and lent its name to the Family Mesembryanthemaceae. Many species that were originally included in this genus have been re-allocated with only a handful remaining. Native to Southern Africa. Cultivated as ornamentals for their showy flowers but some species are considerd invasive weeds. This annual to perennial succulent plant has a basal rosette of green to reddish leaves. The crystalline appearance is caused by the many epidermal bladder cells full of water. These catch the sunlight making the plant sparkle. The white starry flowers are produced in late Spring and early Summer, opening in the morning and closing in the evening. Native to Africa and the Canary Islands. This invasive species has spread around the warmer countries of the world. 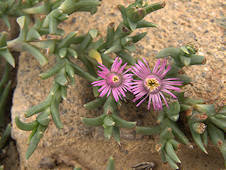 As a salt tolerant succulent, it can grow on coastal margins and other poor, salty soils where other vegetation will not survive. It will not tolerate even light frost. The leaves are edible but may be salty. Leaves from potted specimens were used to treat scurvy on ships, which consequently transported this species around the world. 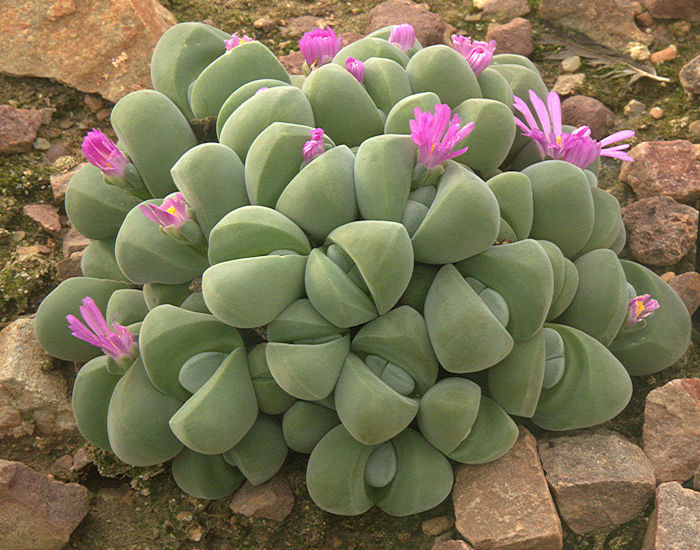 The genus includes 10 species of compact fleshy succulent plants whose rosettes are formed from thick triangular succulent leaves. The green leaf surface is usually covered with tiny dark or white spots. The tuberous roots are edible. 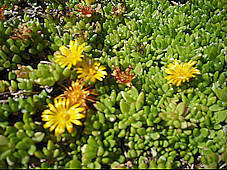 Despite the species name, the bright yellow or occasionally white flowers are not particularly small. Their petals have a darker central stripe in some species. Native to the South African interior, Eastern Namibia and South-Eastern Botswana, experiencing modest Summer rainfall. This is the type species for the genus. The roots of a mature plant are very thick and tuberous. The bright yellow flowers have a reddish stripe down the middle of their petals. Native to South Africa (Mpumalanga). One of the hardiest Nananthus, said to tolerate light frost if the soil is well drained. 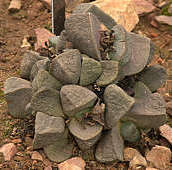 Oscularia includes 25 species of shrubby Mesembs from the Western Cape of South Africa. 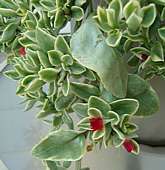 They have fleshy, angular grey-green succulent leaves which may colour up red in full sun. During the Summer these shrubs produce many white or pink flowers scented with almonds. 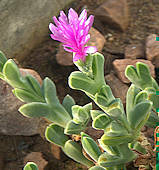 The genus is closely related to Lampranthus. 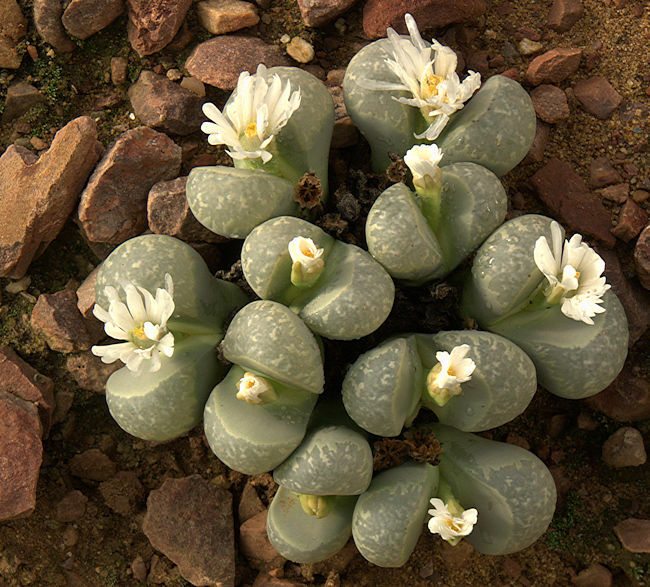 This genus includes 4 species of compact succulent plants, whose bodies are formed from symmetrical pairs of basally-fused, swollen pebble-like, highly-succulent leaves covered in tiny dots. The large, fragrant, daisy-like flowers are yellow to orange or occasionally white to pale pink. Distributed in the Little Karoo between the Western and Eastern Cape Provinces and parts of the Northern Cape Province. Named for: Harry Bolus (1834 - 1911) South African botanist. 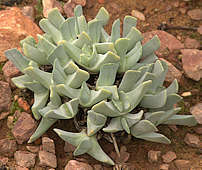 This stemless plant has one or two pairs of opposite, angular greyish-green succulent leaves which are fused at their base. The leaf surface is patterned with many tiny dark dots. Very old plants (left) clump up. Large (2 - 3 in diameter) fragrant, yellow flowers are produced in late Summer. This rock-like Mesemb is native to mountains (2,460 - 3,600 ft) of the Western Cape of South Africa where it receives sparse rainfall, mainly in late Spring and Autumn. The plant body contains the narcotic alkaloid mesembrine and is dried, powdered and used as snuff. 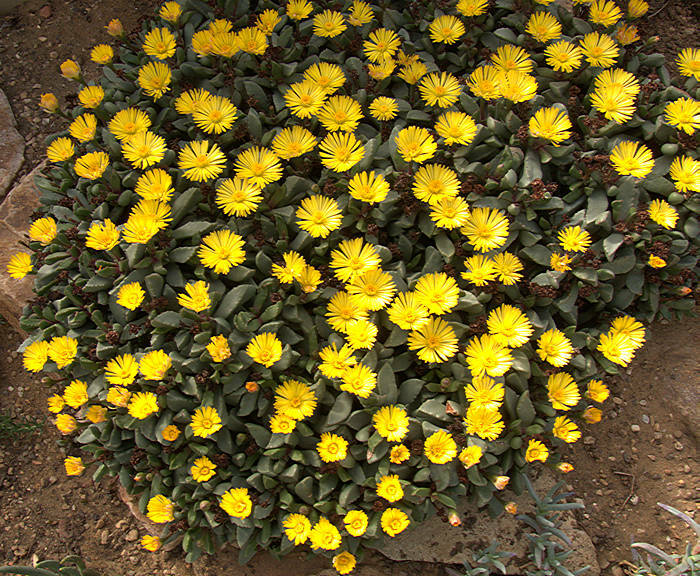 A mat-forming succulent plant with golden daisy-like flowers during the Winter. Native to a handful of sites in the Great Karoo around Prince Albert, South Africa. Named for: Gert Cornelius Nel (1885 - 1950) South African botanist. Pairs of basally-fused blue-grey succulent leaves form a semi-globose body. The smooth epidermis is covered in tiny dark spots. The orange flowers are on short stalks. Native to the Western Cape of South Africa where it receives sparse rainfall, mainly in late Spring and Autumn. 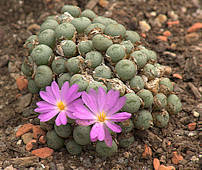 The plant is usually found among quartz pebbles. Named for: Ernst Rusch, Namibian farmer. A large genus with 51 species of sprawling to erect shrubby Mesembs. Five species are spiny. A large number of species were recently moved into Antimima, mainly on the basis of their fruit structure. 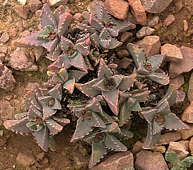 The small succulent leaves have a triangular cross section, sometimes with toothed margins. The pink or purple or occasionally white flowers have a central cone of filamentous staminodes surrounding the yellow stamens. The fruits have 5 or 6 locules, no valve wings, small hook-shaped closing bodies. The valves have small expanding keels. Native to Namibia and South Africa. Some species are frost or fire resistant. 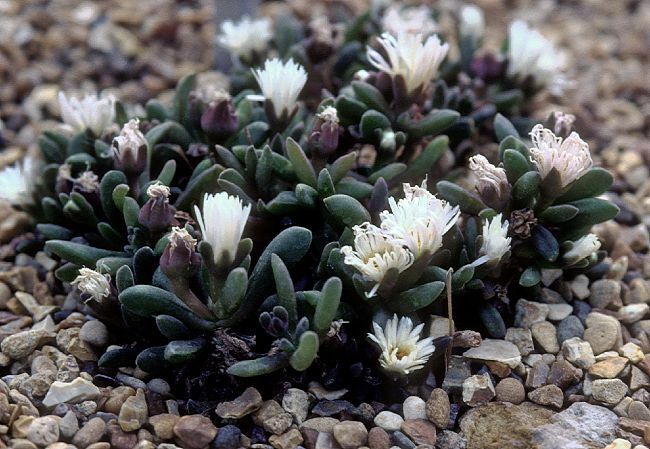 Since some species are hardy and free flowering, Ruschia can be seen cultivated as a rock garden plant. Name: Latin calycinum = with a conpicuous calyx A sub-shrub with keeled leaves and large solitary white flowers at the ends of stems. 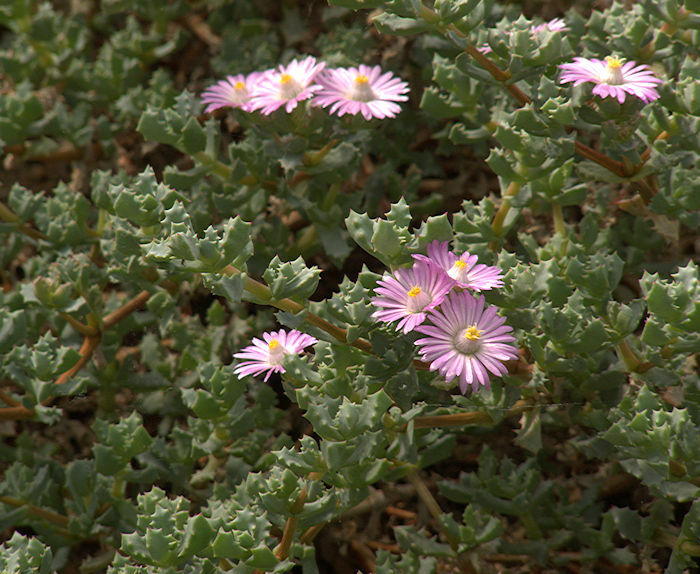 Native to small regions of the Western Cape of South Africa, growing on rocky slopes. 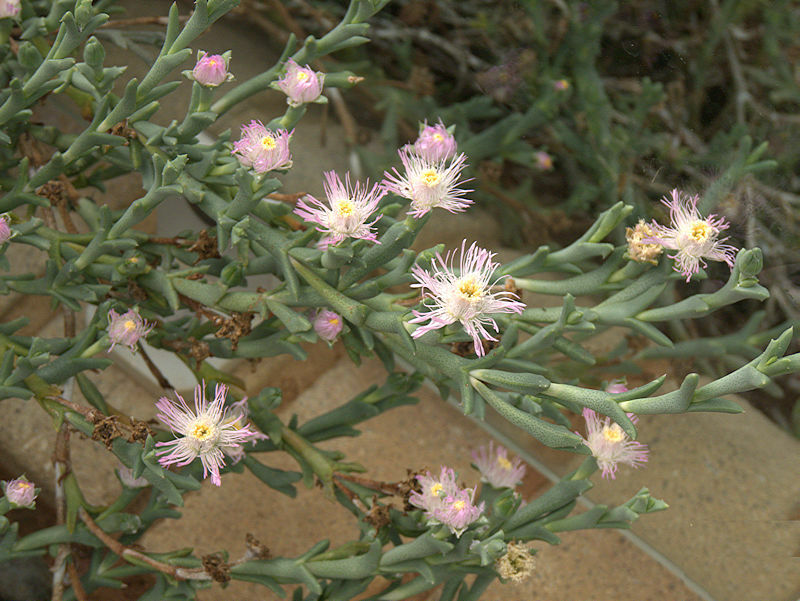 This robust shrubby succulent plant has larger leaves than other members of the genus and spreading fibrous roots to scavenge scarce rainfall. 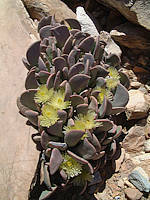 The ends of the woody branches bear large, opposite blue-green succulent leaves with a triangular cross-section and reddened tips in full sun. The relatively-small purple flowers have a central cone of staminode filaments and stamens. Flowers are produced freely and can cover the shrub. Widely distributed from Southern Namibia to the Western Cape and Eastern South Africa. 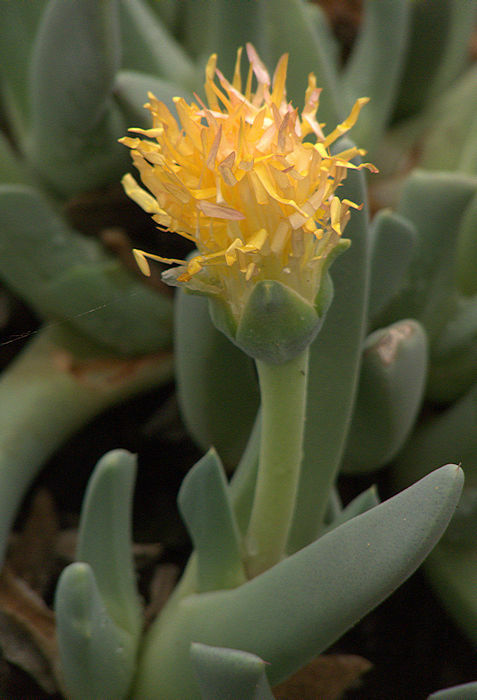 This succulent plant grows at modest elevations of up to 2600 ft above sea level, resisting frost and fires. 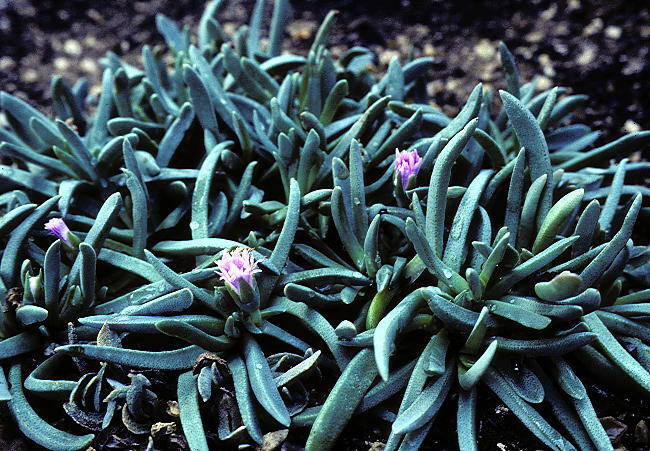 This procumbent shrubby succulent plant has a blue-green stem fused with stubby ovate leaves with toothed margins and keel. In the Spring, a single pale purple flower with a central cone of golden stamens is produced at the end of each stem. Native to the area around Prince Albert in the Cape Province of South Africa. Suitable for dry landscaping in a warm climate. This genus is monotypic for Ruschianthus falcatus. 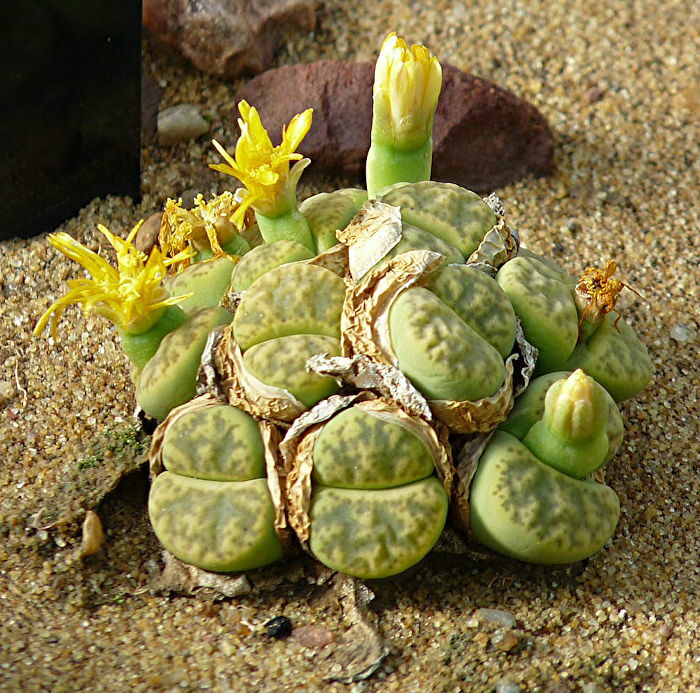 Endemic to a small area of the Southern edge of the Namib desert. The plant is formed from pairs of greyish sickle-shaped leaves up to 2 in long. 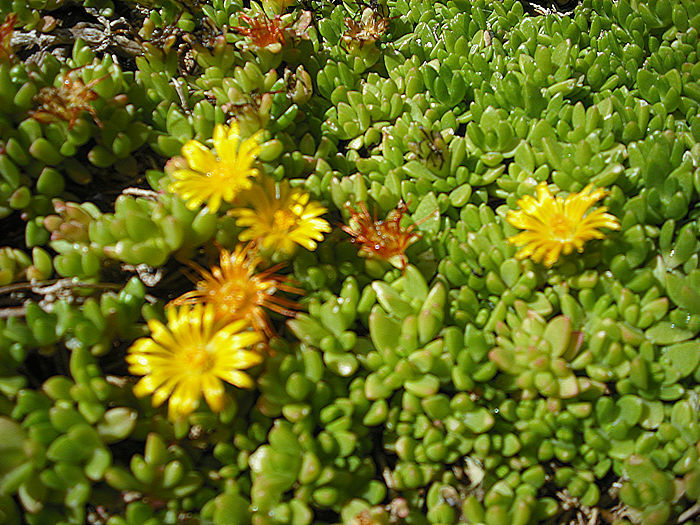 Greenish-yellow flowers are produced in early Spring. 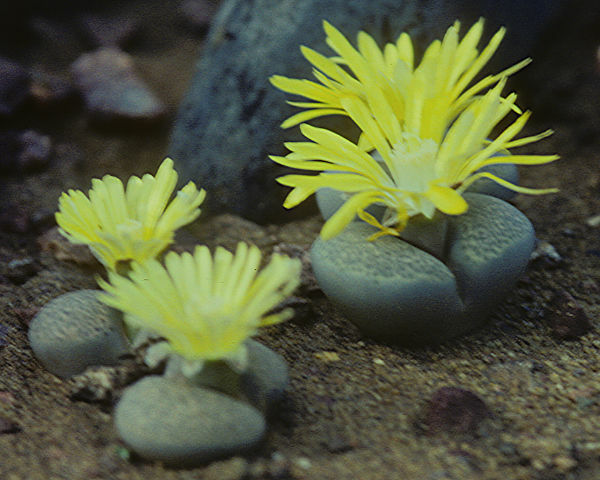 Native to rocky slopes in the Southern edge of the Namib desert near to Namuskluft, Namibia. The known population is so small that it must be considered to be endangered. A Winter grower, so needs water in the Autumn and resting during the Summer. 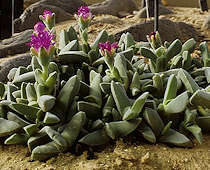 This genus includes 39 species of compact mat-forming succulent plants with pairs of opposite, triangular, thickened, dull green to purple-red succulent leaves. The margins are usually furnished with teeth and small warts. In the Spring the plants produce a perfumed white or yellow daisy-like flower. Native to South Africa where they experience Summer rainfall. 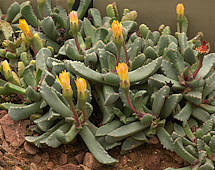 This succulent plant forms mats of rosettes consisting of opposite pairs of keeled succulent leaves with up to six marginal teeth and an epidermis covered in small pustules. The flowers are yellow. A genus of 34 species of dwarf succulent shrublets with alternate grey-green succulent leaves whose apex is crowned with a cluster of small bristles giving the appearance of a cactus areole. 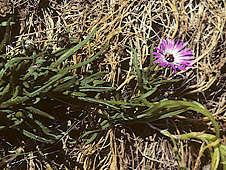 The small daisy-like flowers produced at the ends of the stems can be white, yellow, pink and purple. Most species are easy to grow. Some species T. bulbosum, T. stellatum form a particularly tuberous root that can be raised for display as a bonsai. The fleshy triangular succulent leaves are slightly pubescent and their tips furnished with a cluster of hairs. The purple flowers have a pubescent pedicel and bracts. A mature plant develops a fleshy rootstock which can be raised for display although the plant prefers to have its roots buried under at least a top dressing of grit. - a classic that has kept its value. The Gibbaeum Handbook by G.C. Nel (1953) Publisher: Blandford Press, London. - a classic with colour plates and detailed b/w drawings and photographs. The Illustrated Handbook of Succulent Plants in six volumes represents the first comprehensive taxonomic treatment of succulents in thirty years. It covers over 9000 taxa of all succulents except Cactaceae with chapters on individual plant families written by experts. This up-to-date work is ideally suited for anyone interested in these fascinating plants, including hobbyists, plant scientists, horticulturalists and herbarium staff. 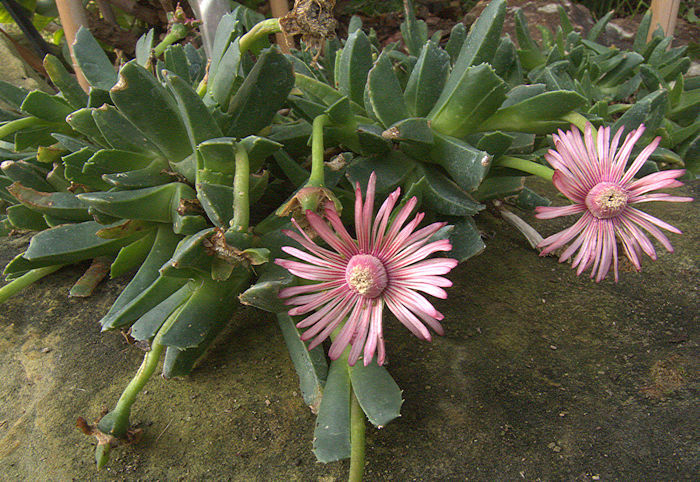 The large Aizoaceae Family is covered in two volumes.